I got a call from Mick Dennehy saying we’re going out for the coalies are you coming? As they say in Jerry McGuire…. You had me at…. alright langer! I made my way down to Kinsale where Pedro was already on the boat. 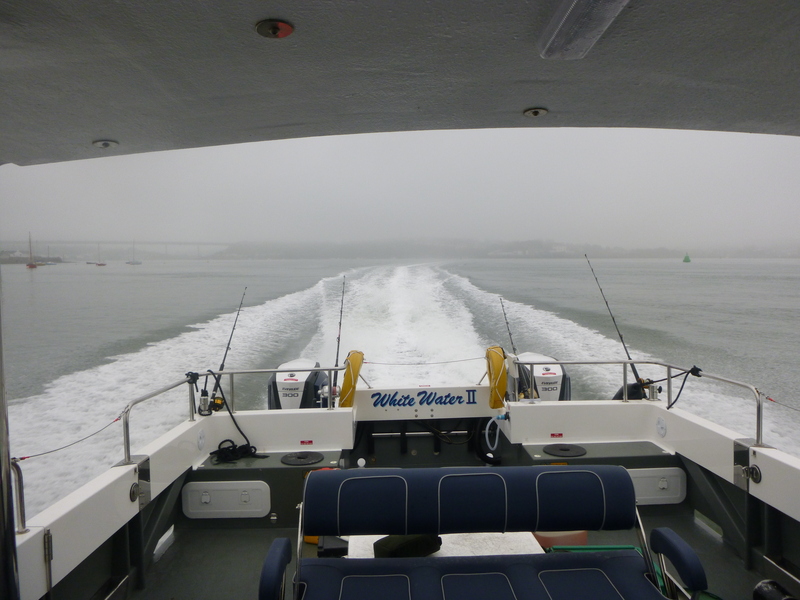 Also making up the crew that day were some of the most experienced boat anglers in the country. Albie O’ Sullivan the Irish Ling record holder with a lifetime of experience, top charter skipper and good friend Kit Dunne, then Phil Barry and Paul Ross so I was feeling a little out of place to say the least. We made our way out as everyone made last adjustments and superstitious tweaks to their gear. When we arrived Mick positioned us perfectly for the big tide and bit of wind and soon we were dropping down. Before I could even get to the bottom I seen Paul and Albie were already into fish. 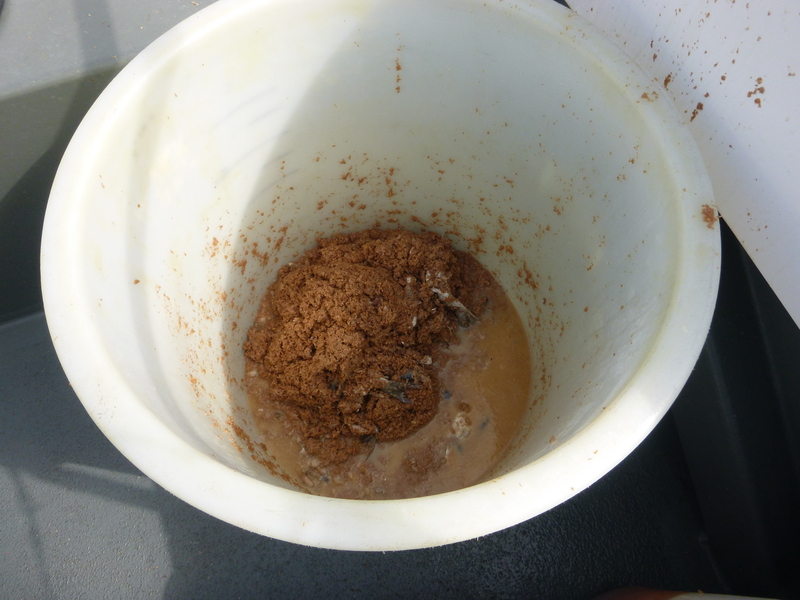 Before my shad could get to the bottom it was inhaled on the way down…. fish on. With the guys getting their fish to the surface and netted it was two specimen coalies for the first two to drops. I got my fish to the surface and again it was over the specimen weight. Phil and Kit were also getting the action but it was all a bit of a blur as we concentrated on our own fishing. Albie then brings up the best so far a clonker of a fish making us all the more eager to get the gear back down to the wreck. Next up I’m on again to a decent fish and this turns out to be the best of the day I was absolutely delighted. We were mostly changing between different sized shads and Paul Ross was doing some damage with a tiny sidewinder clocking up quite a few species including megrin. 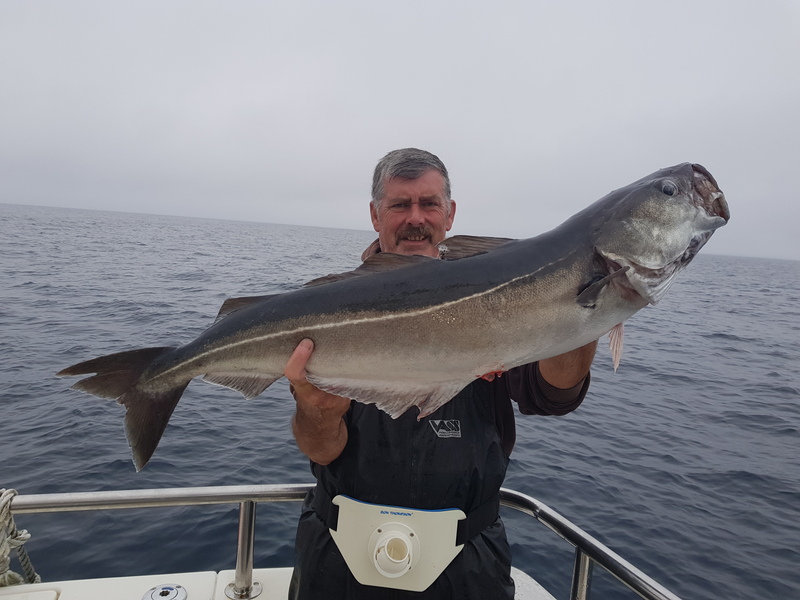 Soon it was time for lines up, we had watched sharks attack baits at the surface, sunfish and some whales and to top it off the fishing was top class with ling, pollack, cod, megrim and coalfish. 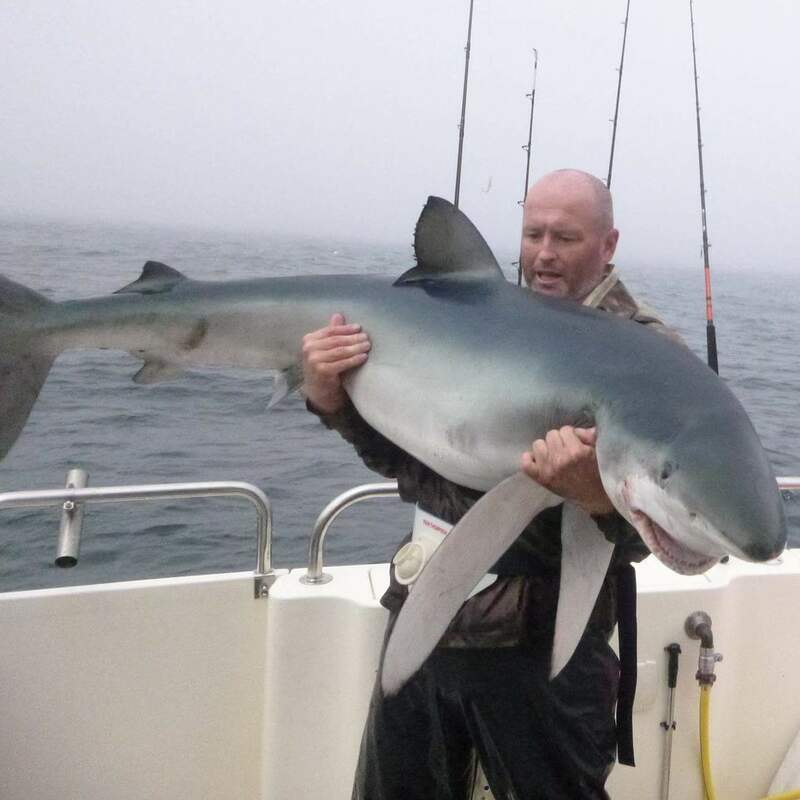 IFD: On the fifteenth of July this year I got a call from Pedro Walsh, from the sounds in the background I thought he was in the pub but it turned out that Henry Kelly had just caught and released an extremely rare fish in Irish waters, the Shortfin Mako Shark and now I understood the shouting. 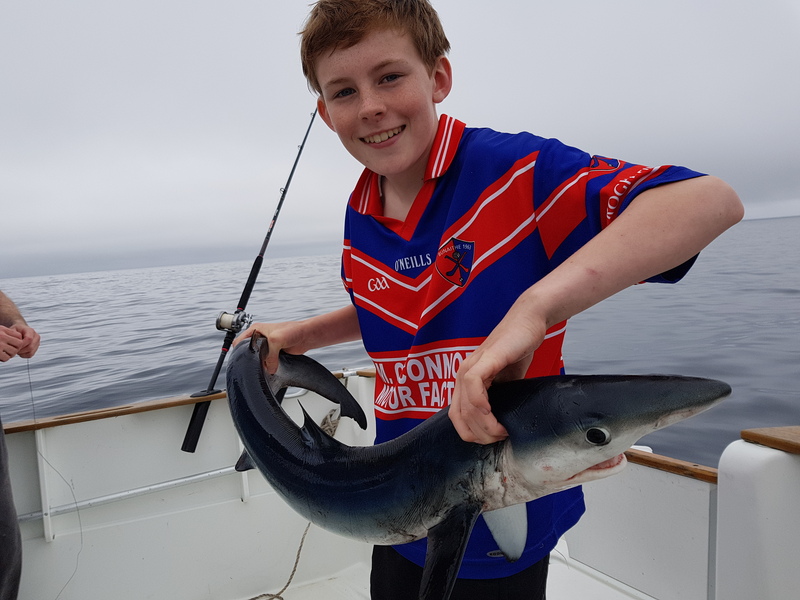 Henry was fishing aboard the Silver Dawn, http://www.kinsalecharters.com with gifted skippers Mick Dennehy and Pedro Walsh who had just added another new species to their already impressive tally of achievements. 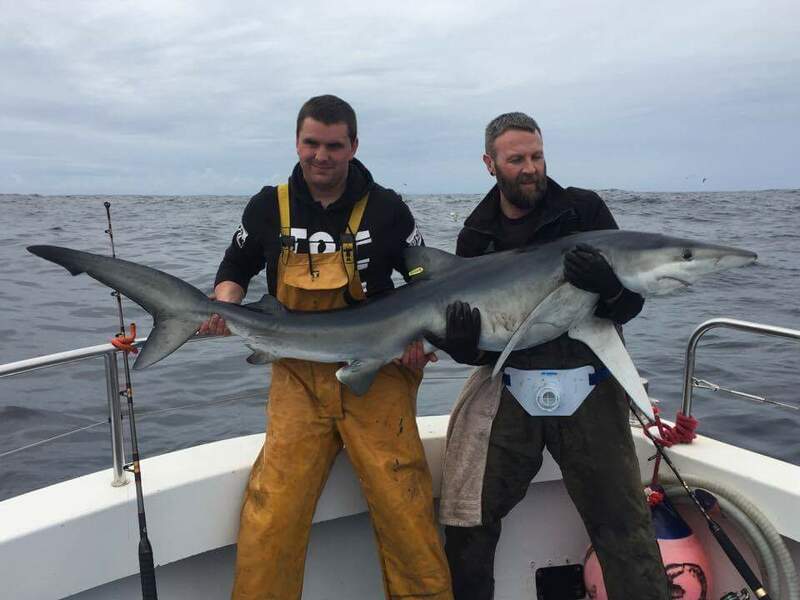 This was only the second mako in Irish waters in recent years and only the fourth ever. 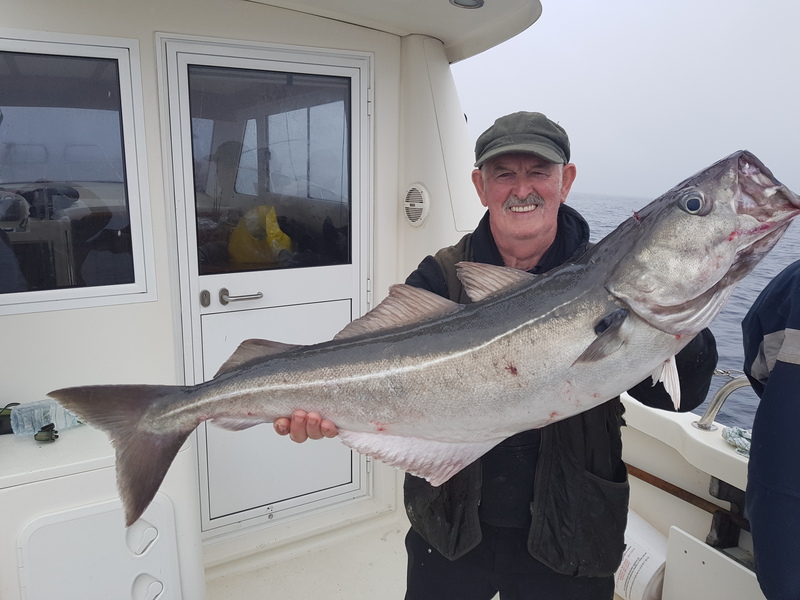 The other records were; a 79kg from Kinsale in July 1965, a 45kg from Kinsale in August 1965, then again on Tom Collins boat from Union hall in 2013. 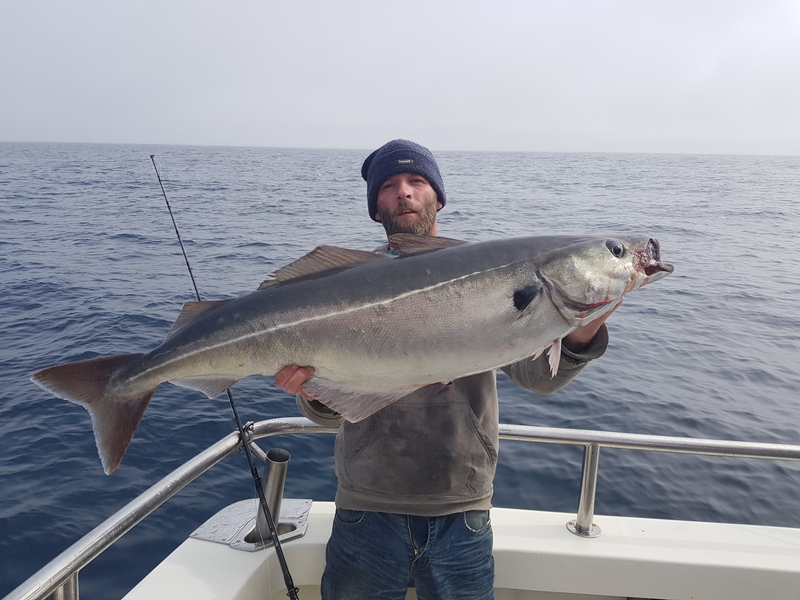 These spectacular fish were recorded with fair regularity off Cornwall from the 1950’s through to the 1970’s, although never numerous with just a few records each year, with the vast majority taken by the famous Vinnicombe brothers. 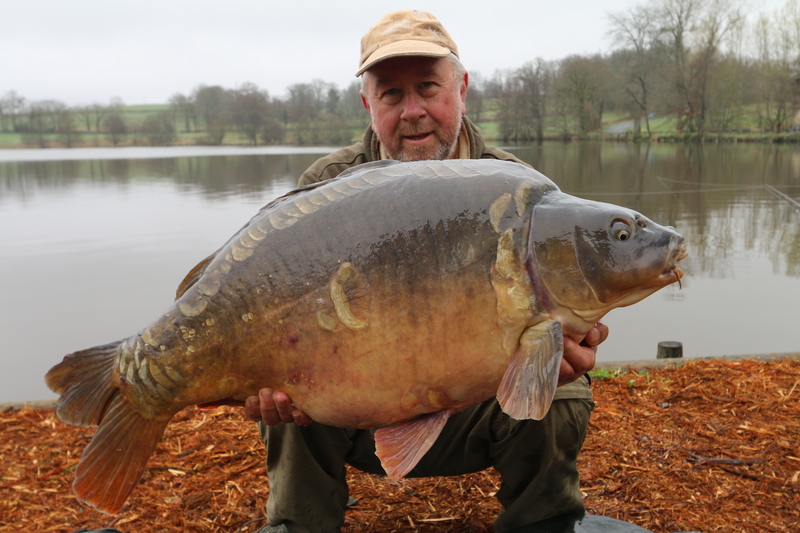 There was a long wait until the next British capture in 2013 with Andy Griffiths fish taken on Whitewater skippered by the one and only Andrew Alsop. 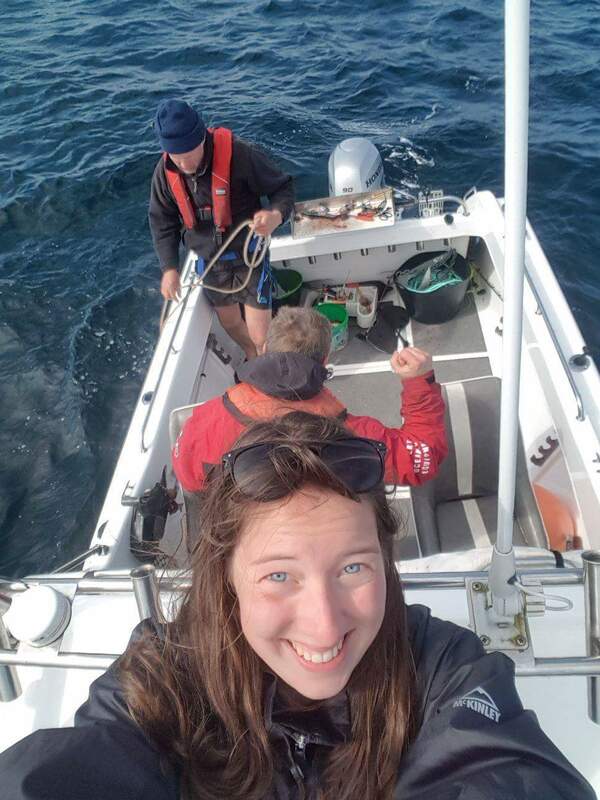 It is very interesting to note that the fish tagged on Tom Collins boat was recaptured the following June, 80km NW of Lisbon, Portugal having travelled a distance on 1460km. It is also interesting to note that three of the four Irish records on rod and line have come from Kinsale with one further unconfirmed report in August 1990 also from Kinsale. I was having a bad start to the year, I came out one morning to find my van had been wrote off by a hit and run driver which meant I had to cancel most of my fishing trips. Also joining us on the trip was Mark and his brother Jay. 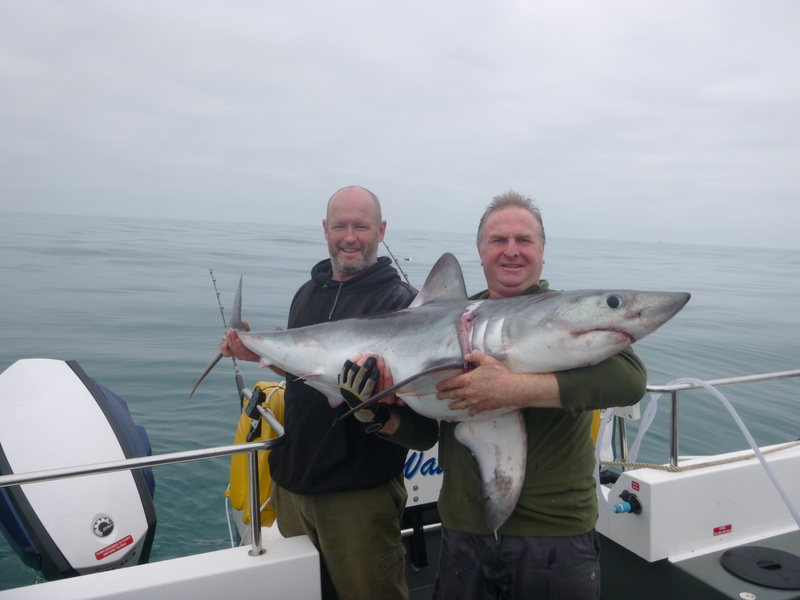 I was hoping for a porbeagle or blues as it’s always a good days sharking with the lads. With the chum sacks in the water we were soon getting some blue sharks. 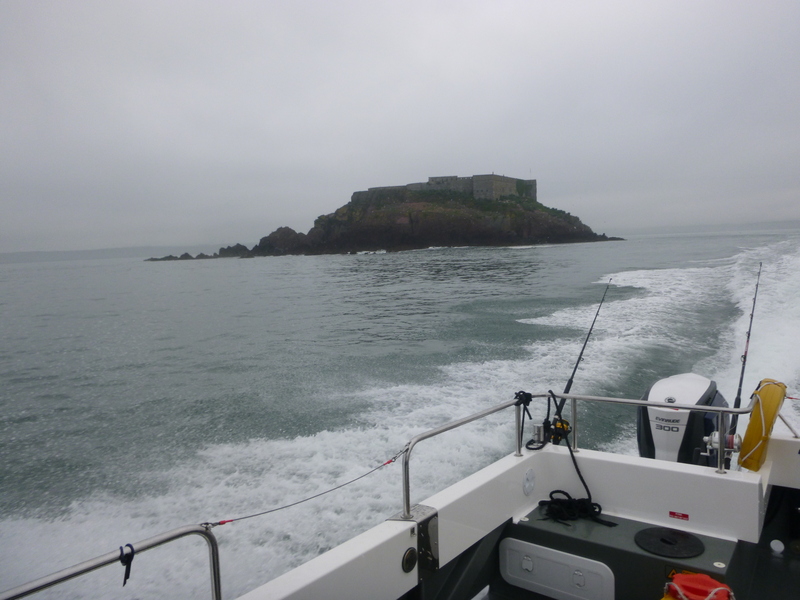 The wind was with the tide that day so we were drifting along at a fairly swift rate. 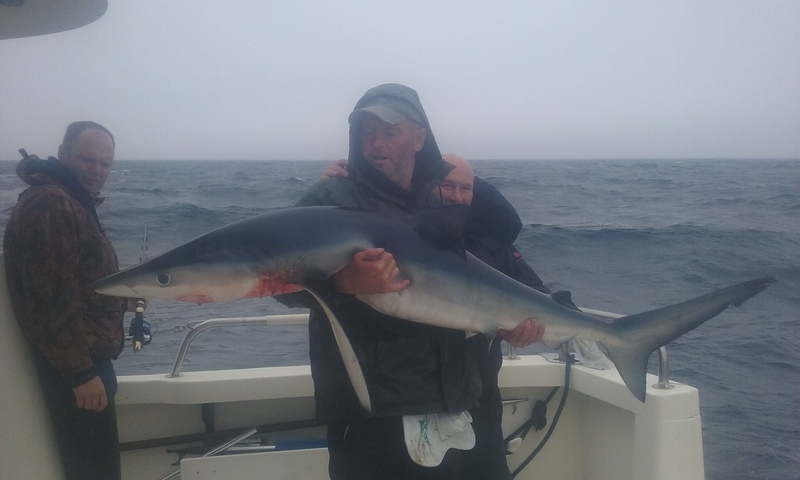 After a while things went quiet until I got a run on my rod that looked a bit more interesting and I hoped it was a porbeagle. Just as I was thinking what is this?…. The shark came airborne out of the water by about ten feet then somersaulted back in! 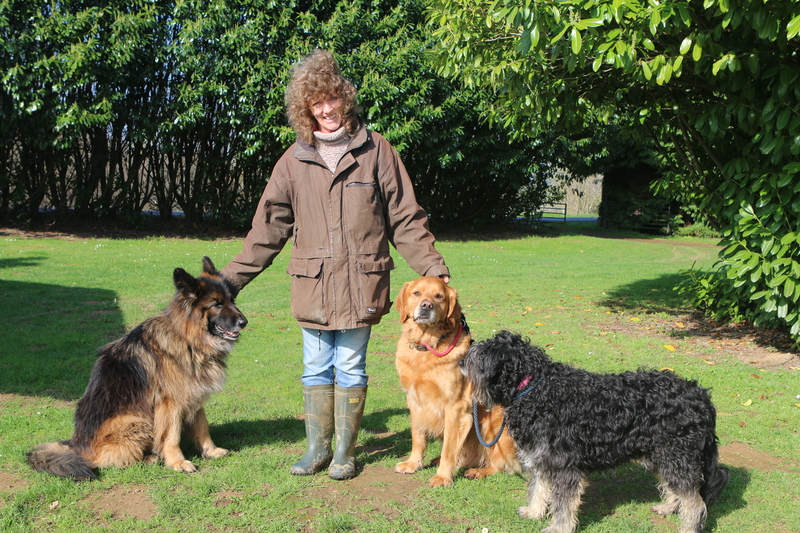 We were all gobsmacked, we were just looking at each other thinking it couldn’t be???….. could it? At this point Dan mentioned this might be a mako Henry, but I just wanted to get it in whatever it was! 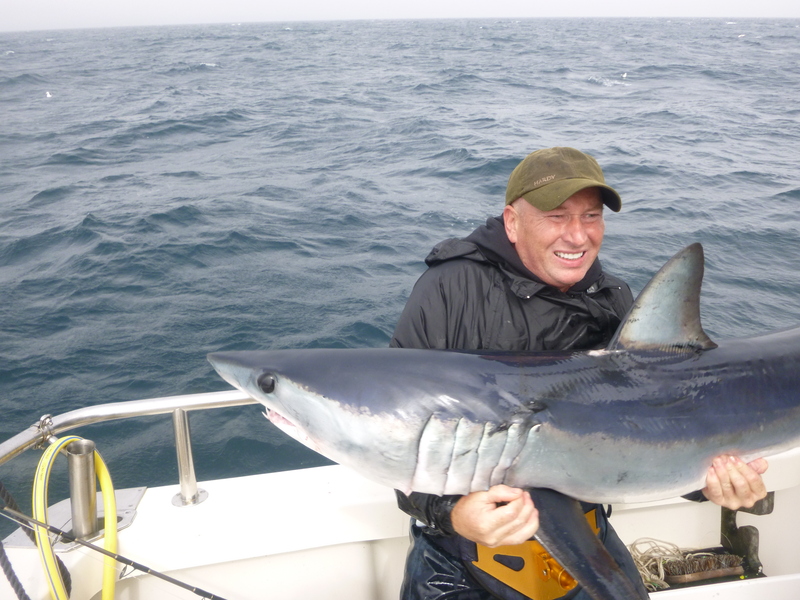 At first it came up quite easy and Mick soon had the leader in his hand when he confirmed it’s a mako! The shark on seeing the boat had other ideas and just took off making a blistering run. This time it took me around the boat and I had to manoeuvre past one of the lads who was into a blue. It was going under the boat and I had to hold the rod out to get it back out. After Mick had called it as a mako the adrenaline was flowing and I was just concentrating that it wouldn’t get off. 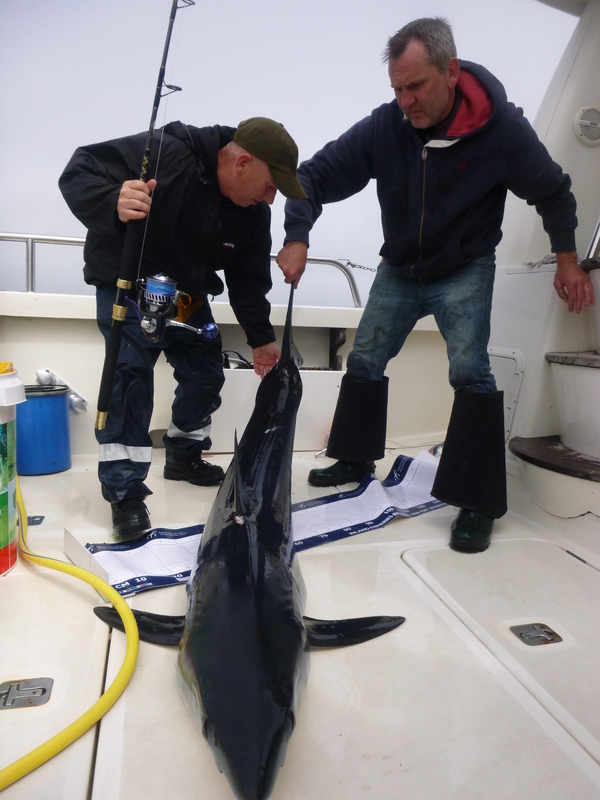 We eventually got a rope around the tail and brought her aboard. As she was safely aboard a big cheer went around the boat with everyone celebrating. I couldn’t believe it I was still in shock. 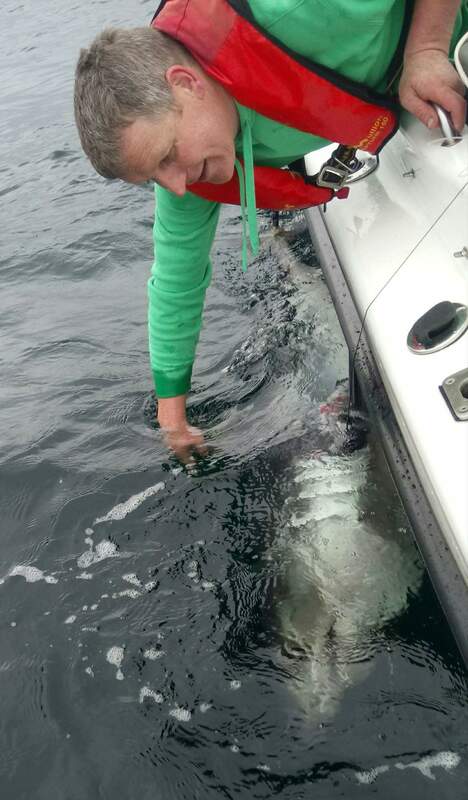 We took great care with the shark and after a few quick photos and measurements to confirm it was 84lb she was put back and swam off strongly. 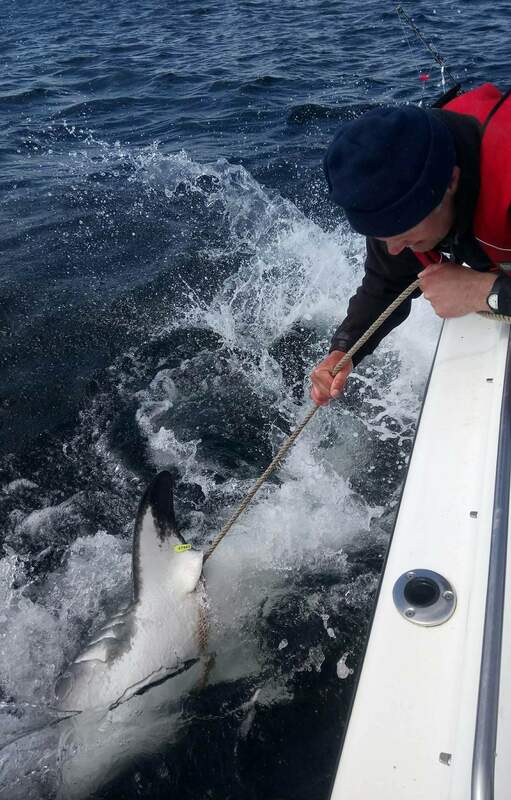 We were all shaking hands and back slapping it was a magic moment and I was glad to be part of Irish shark history with only the fourth mako caught on rod and line in Irish waters. Me and the lads usually have a tenner on the best shark of the day, we have done so since I first met Dan while sharking with Kit Dunne. I had come close a few times but never won it. It was a year to the day since I had lost my nephew who was like a brother to me so that just made the capture so special, it looks like I had finally won it and I couldn’t help but think he had played a part in it somehow. The drive home I was just on cloud nine, a fishing day I will never forget…..
For the first part of this year I had barely been fishing, so it felt good to have some boat sessions to look forward to. Aidan Cox, Dan O’Kelly, Mark and myself met up for a late start through the Dublin traffic in a smoothie session where we had several specimen sized fish. Kit as always used his expertise to locate the fish and keep us on them for the whole session. 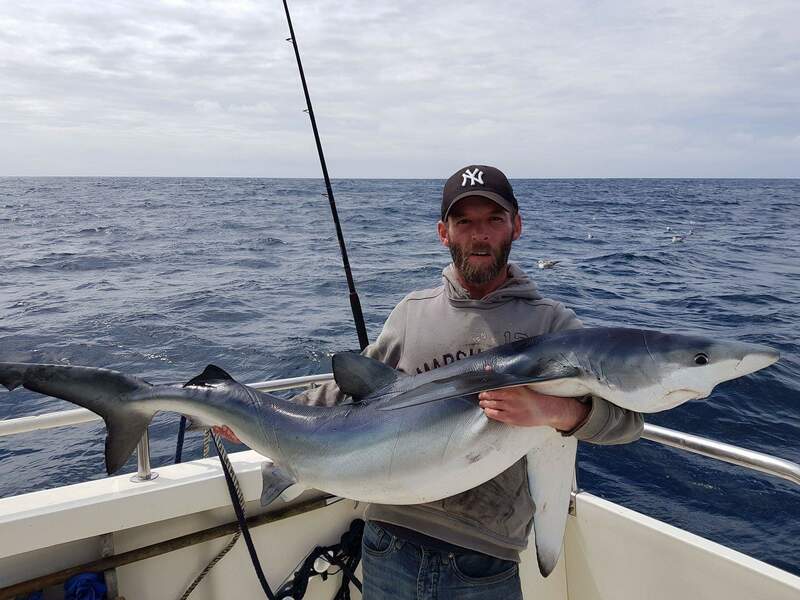 This time we were after blue shark and the day wasn’t to disappoint with many sharks coming to the boat it was great action but no biggies as Mick put us on fish after fish. Myself, Rob, Dan and Mark had plenty of sharks, the best of which going to Dan and I had a similar sized fish that we unhooked at the side of the boat as one was already on the deck. 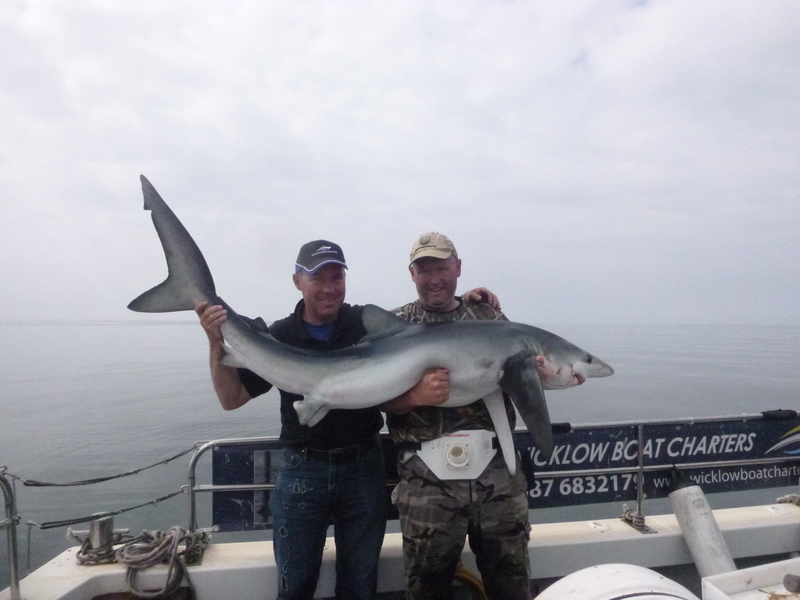 The following weekend Kinsale charters was booked out for Mick so Rob offered me a seat on his boat to go sharking again. I met Rob early and soon we were heading out with Hugh Cronin and his son Luke. We feathered up plenty of mackerel and soon we were getting a few blues. We had about fifteen between us with Rob at the helm. 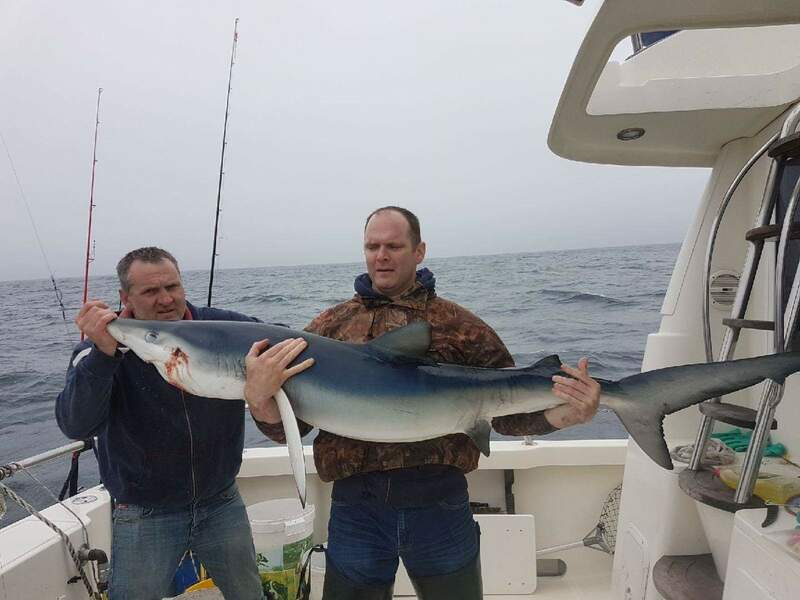 Rob decided to try for a porbeagle from an area that served him well last year so we upped sticks and moved to another area where after seeing a good fish come up to the dubby bag Rob got a run on the far rod resulting in this fish. The process of choosing a family holiday destination in our house is always contentious. My suggestions of Islamorada, Cape Verde or The Azores, are seen for what they are, shameless attempts to visit some of the sport fishing capitals of the world. This year we settled on Croatia, and I set about finding out how I could squeeze a day’s sport in during our 2 week holiday. I emailed them with the dates of my travel, and Željko emailed back explaining that the bluefin only move back inshore during July and that I should take a day in the second week of my holiday to give myself the best chance. On his advice I picked a date, and transferred a deposit. 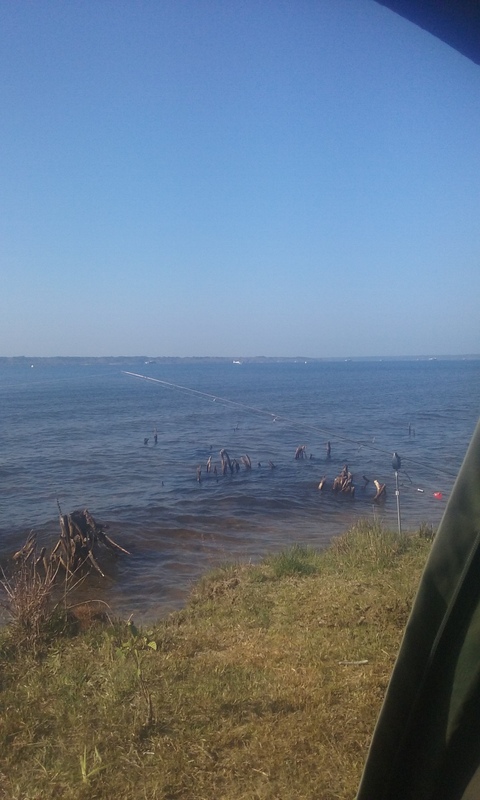 On the day of the fishing, I arrived at Jezera to blue sky and hardly a breath of wind. I met the skipper Vladimir on the pier just before 9am, and as soon as I stepped on his smart 27ft boat, I realised he was running a serious sportfishing operation, and not fishing trips for tourists & day trippers. The gear bore names synonymous with game fishing throughout the world, Stella, Tiagra & Alutecnos, and at the business end were flourocarbon leaders and Owner Mutu hooks. took about 45 minutes cruising at 18 knots. livebait tank, more than enough to get started with. 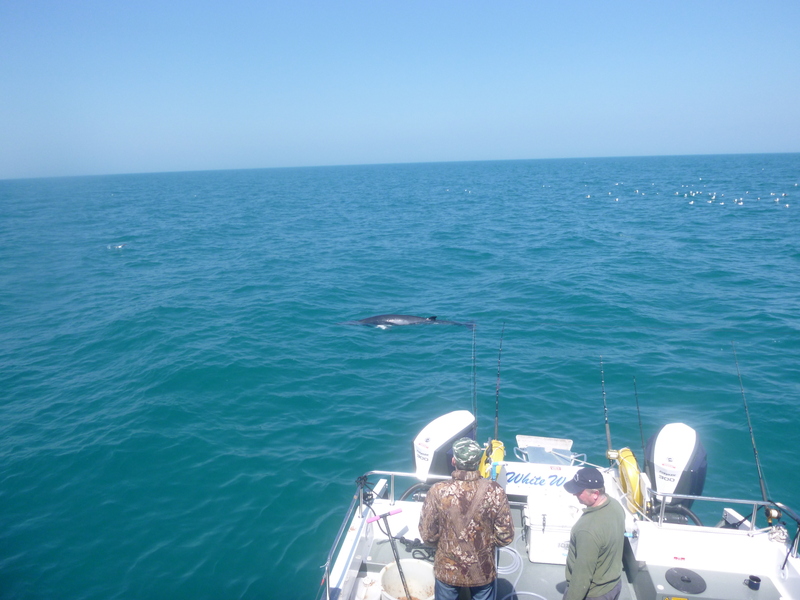 Vladimir repositioned the boat, dropped anchor, and set out 2 live baits on balloons. 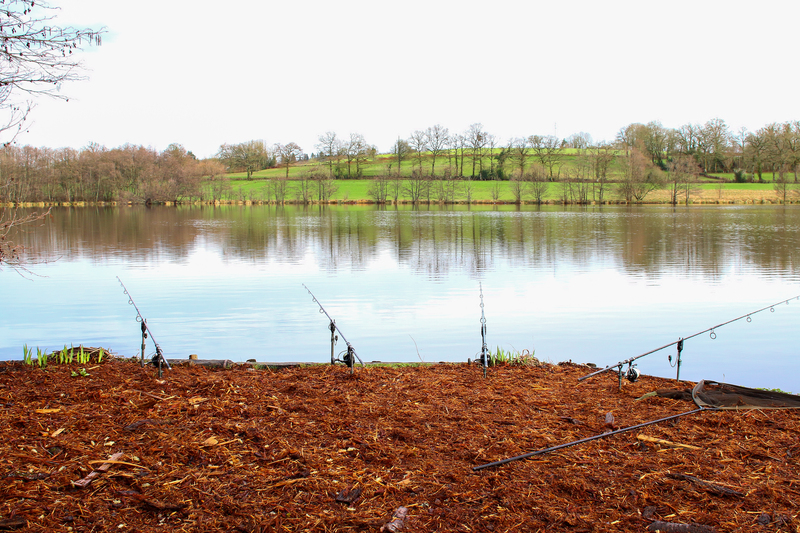 set up, and baits are rigged, you pick up tricks and nuances that you just don’t get by reading articles and forums. 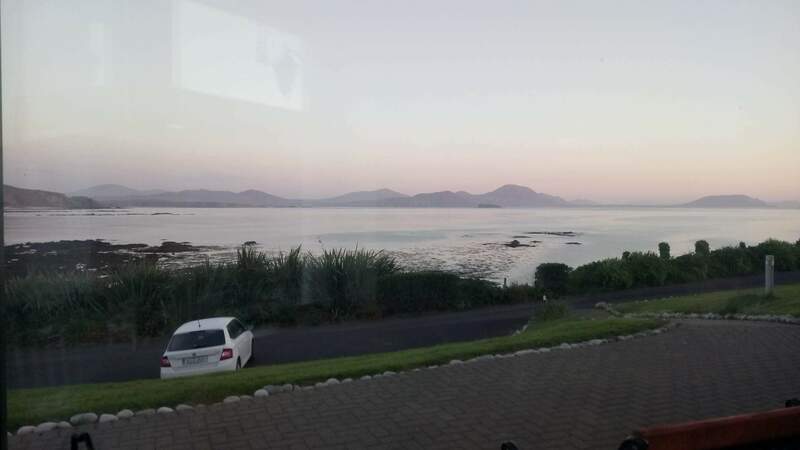 I was carefully watching each detail, and the amount of questions I asked was bordering on interrogation, but a lot of the appeal of fishing abroad is learning new things, and I wanted to make the most of it. watch a spread of lures. 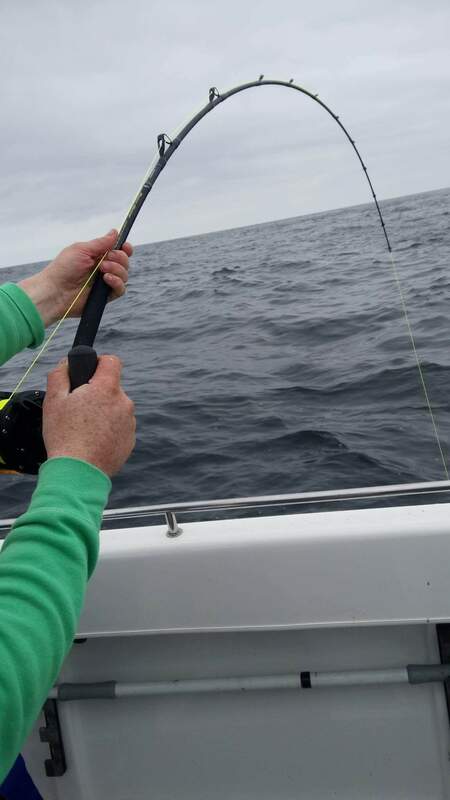 As we were anchored in 70m of water, and fishing live baits however, it was possible to fish the bottom with 2 hook rigs baited with mackerel strips while we waited for a Tuna. This brought a steady stream of fish, the only one of which I recognised was black bream, but there were 3 other species that kept making an appearance, one of which wouldn’t have looked out of place in a tropical aquarium. 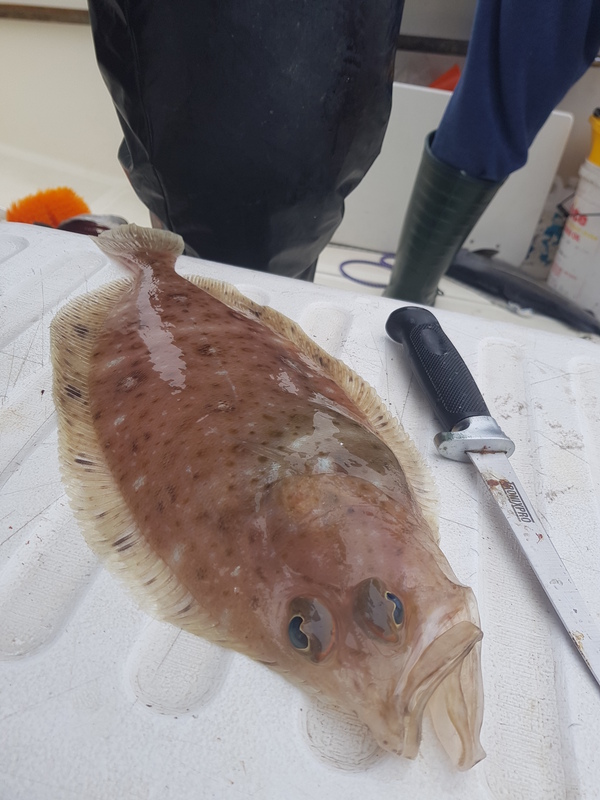 John Dory are also regularly caught here, although small live baits prove more effective apparently. 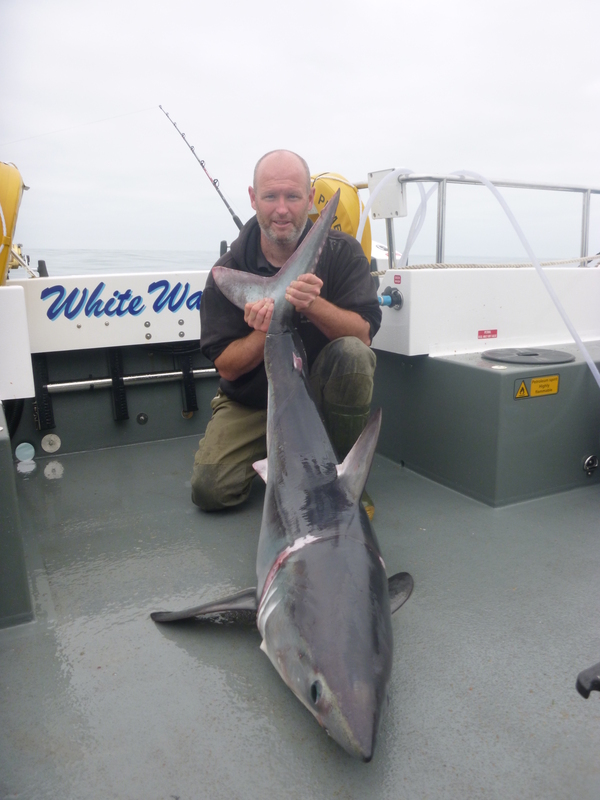 This fishing certainly kept me busy, and helped keep the live bait tank topped up, as I would often pick up a mackerel or scad on the way up with the spare hook. the fish was at the side of the boat. Vladimir sunk in the gaf and tied the fish off on a stern cleat. although I was pleased to have got one, given it was still early in the season. Vladimir explained to me that his bluefin season runs from July right through to the 31st December when the fishery is then closed, with the Autumn & Winter months being particularly good. By the end of the month of July, you could expect rather than hope to catch a fish every day, with multiple fish days common enough. 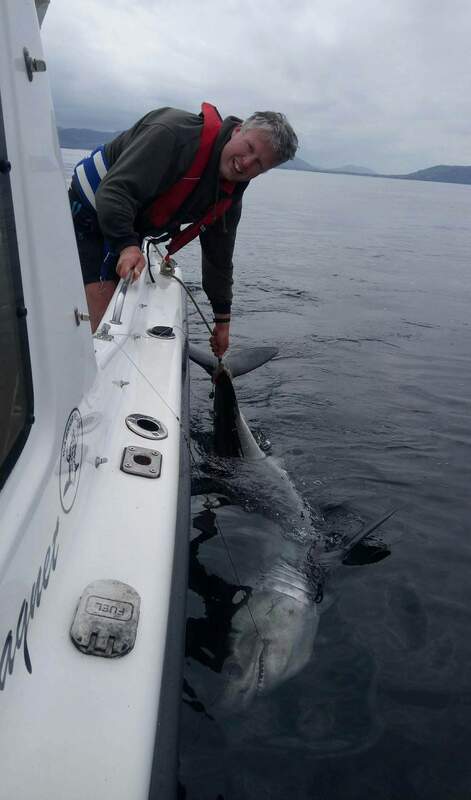 “But we have giants in Ireland” I hear you say, “why would I go to Croatia?” but I believe this provides a different angling experience to the traditional trolling with large squid bars fishery that we have in Ireland. 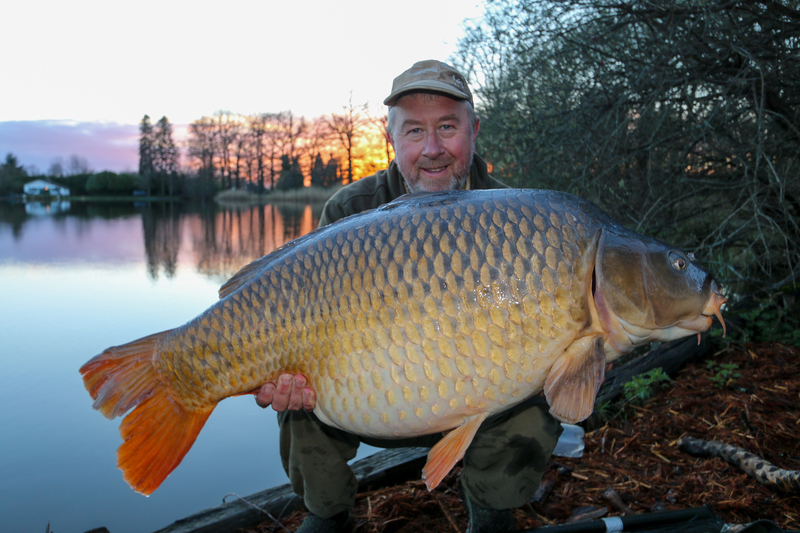 losing a fish he reckoned was 230kg (500lbs) after a lengthy fight. 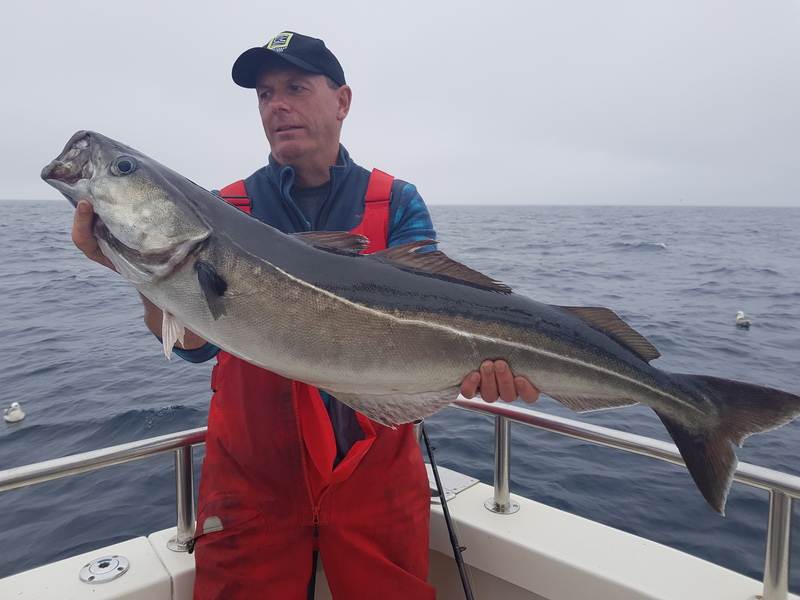 His fishing doesn’t stop when the fishery closes on New Year’s day either, for he has some spectacular deep jigging for Amberjacks through the winter and spring. These range from 25 –100lbs and days with 15 – 20 fish a real possibility. looking to get away and try something different, without having to rob a bank, should take a look at Croatia! Just a final word on sustainability. 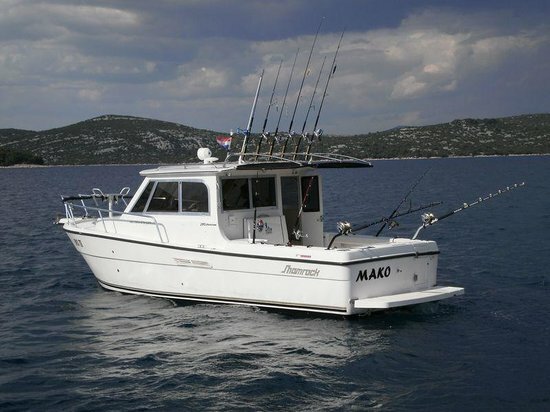 Vladimir buys several tonnes of Bluefin quota at the start of every year, and so the fish that he lands make up part of Croatia’s national commercial quota. Following ICCAT drastically cutting the eastern Atlantic & Mediterranean quota for Bluefin several years ago, we witnessed an amazing return of these fish to our waters here in Ireland, and indeed last year several fish were caught in southwest England and Wales, areas not previously regarded as Bluefin hotspots. Vladimir too has seen a significant improvement in the Adriatic. 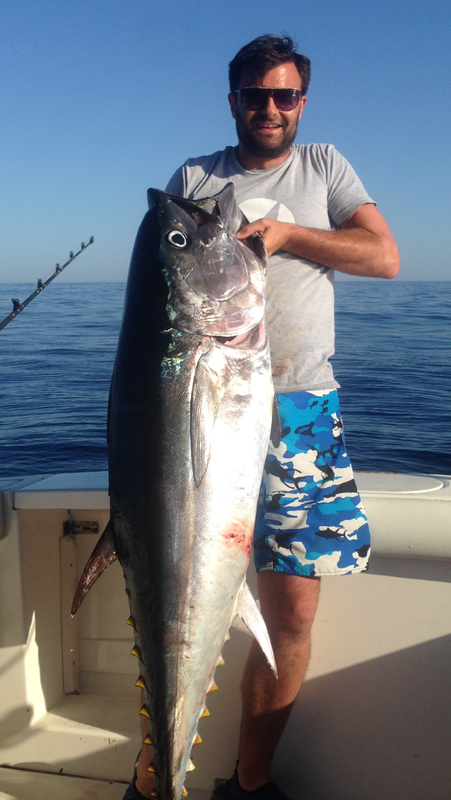 We must hope that the stock continues to be managed correctly, so that anglers all across Europe can continue to enjoy catching one of the world’s most revered game fish and the mightiest tuna of them all the Atlantic Bluefin. 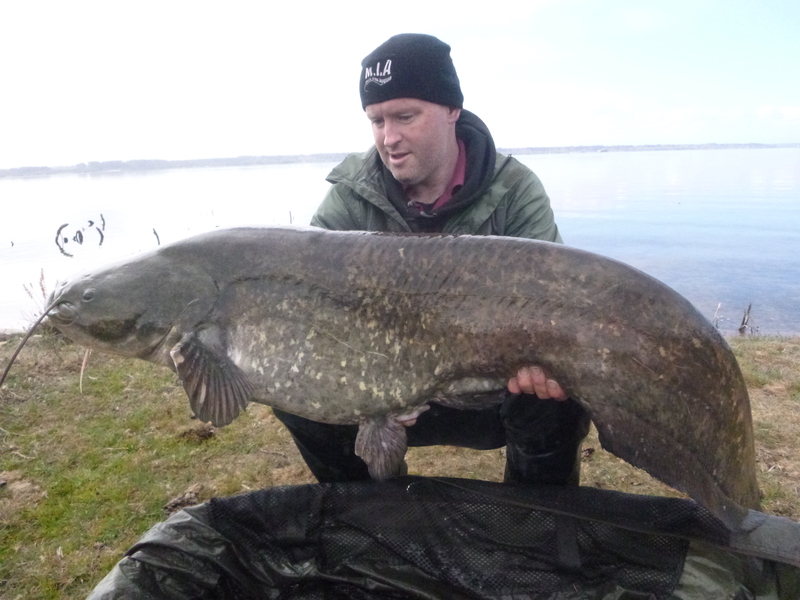 IFD: Dan O’Kelly recounts a recent trip to France fishing huge public waters with Davey Phelan. 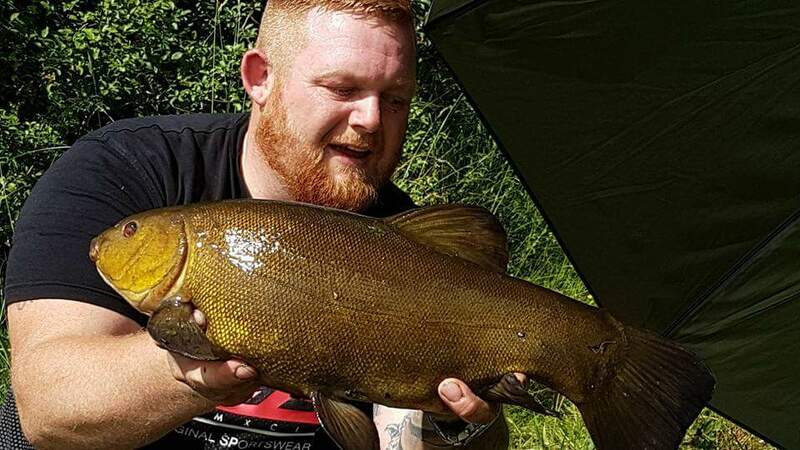 Dan is one of Ireland’s top carp anglers with immense experience fishing in France and this time he fills us in on a trip that didn’t go to plan. 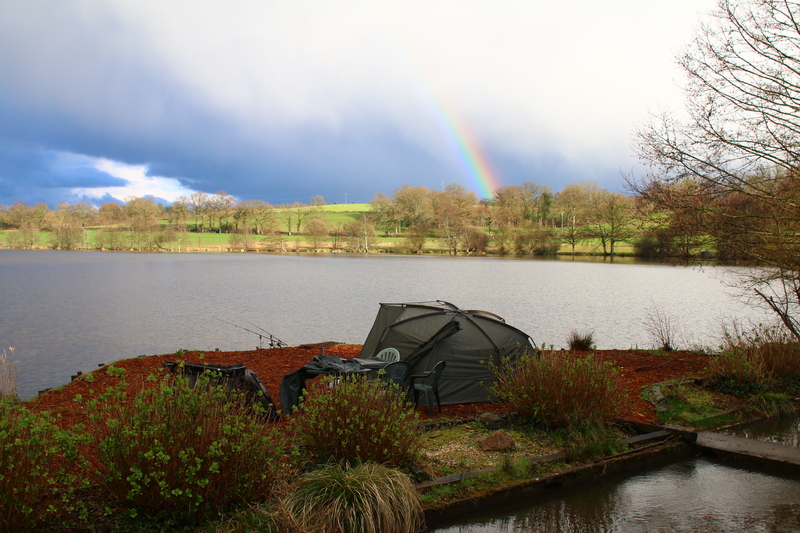 All real anglers can appreciate this and it’s a refreshing account of genuine fishing…. Well this year rather than do an Autumn session like I normally do I decided to do a spring session on a big public water in France. 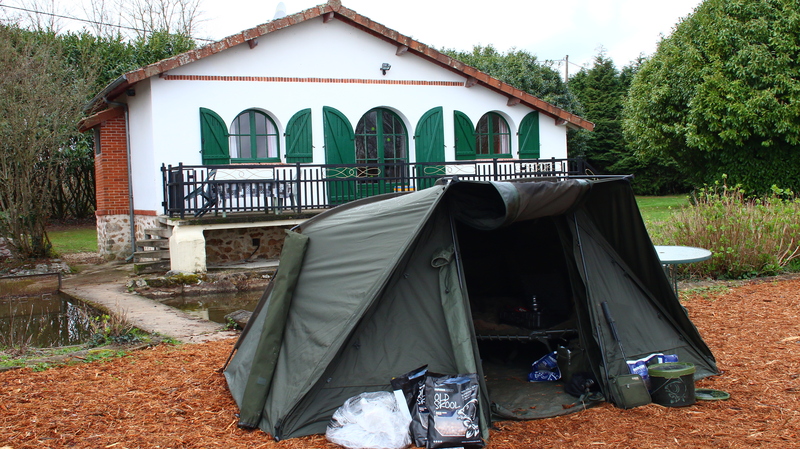 While in France the previous year I found out that a lake I used to fish had, had a night zone reopen. Originally it had been closed due to some clown’s lighting fire’s which made the farmer very nervous, understandable so with the hot summers they get over there and with live stock on the land not to mention the valuable trees, the night zone was closed. I was delighted to find out it was open again. But there were a few conditions and a local bailiff that would be around to check if we were respecting the area and so forth. Not a problem for us as we never light fire’s and all cooking is done inside the bivvy and we never litter. One of the other condition’s was that it would be closed after the 31st of July to facilitate the Hunters. So a autumn session was out of the question either way. Anyway myself and Edgey Dave set about getting our selfelves sorted for the session. In fairness there was not a lot to organise as we’ve done this many times and all we really needed to do was book the ferry and organise the bait. 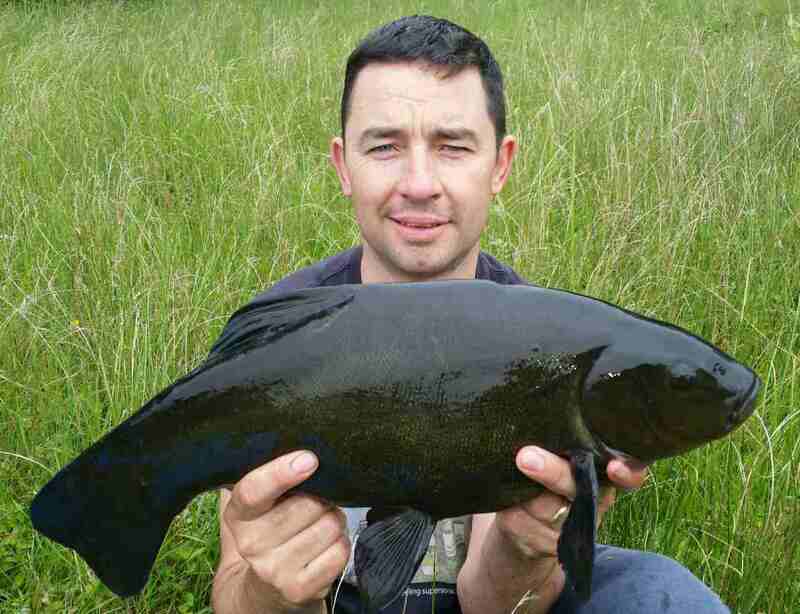 A quick call to Derek in Main Irish Angling and the bait was ordered. 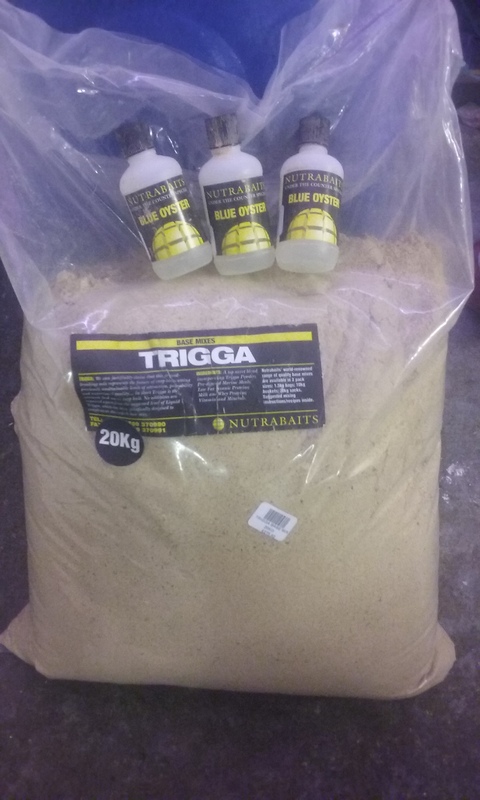 We decided to go with Trigga from Nutra Baits with the flavour been the Blue Oyster also from Nutra Baits also. Then it was just a case of counting down the days to the off. We planned to go in the first two weeks of April. The thinking was that the fish might not have moved towards the spawning areas that early and we might have a chance of connecting with a few of them before romance was in the water. The other reason was that the pike anglers, who can be a royal pain in the arse when fishing the public’s are not allowed fish til the 1st of May. They have no respect for carp anglers and have no problem dropping anchor right on your H-block and fishing away. 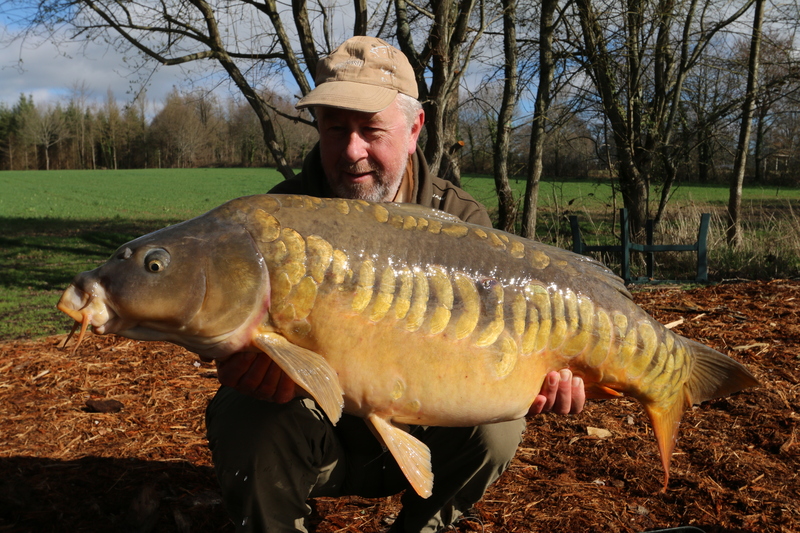 Some areas in France are better and this behaviour is minimal but on this lake it was rife. So the thought’s of fishing unhindered by these Neanderthals made me smile inside and book the ferry. On the way down through France we dropped into and old friend Fred who was working on a lake in the north of France and it was not to far out of our way. 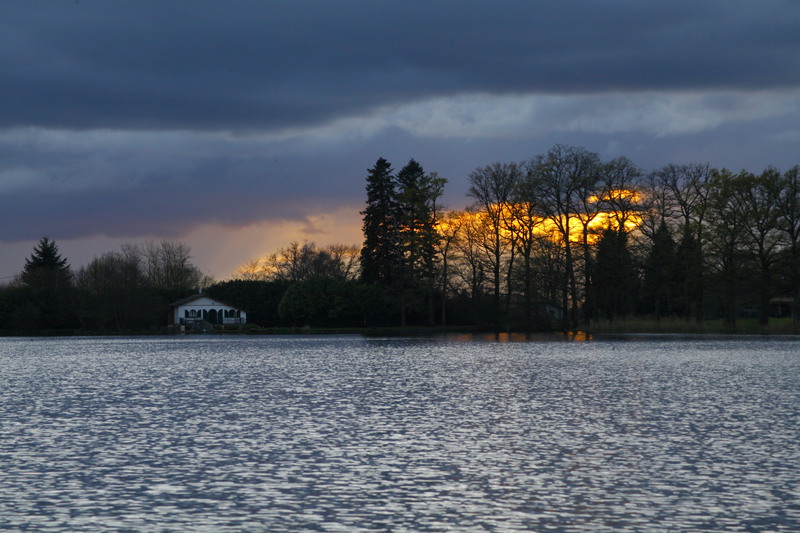 Due to the ferry times early and late in the season it’s nearly impossible to get fishing the first night as it would be well into the night before you arrived and even later before you got settled. Finally we arrived on the lake and to our delight the swims we wanted were open. 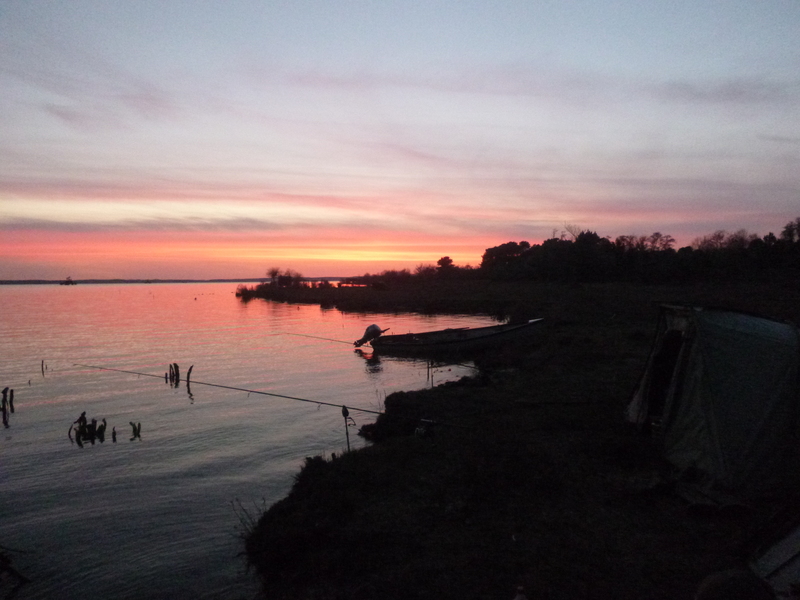 There were a few others carpers on the night zone but it is a very big zone 4kms in total so sharing was not an issue. Launching the boat was, but I knew a spot we could slip the boat in. Getting it out again would not have been possible in this spot. The main harbour would have to be used for that job, which could be worried about at a later date. Right now the main concern was sticking our flag in our intended swim. Once that was done and all the gear was unloaded, taking two trips in the boat. 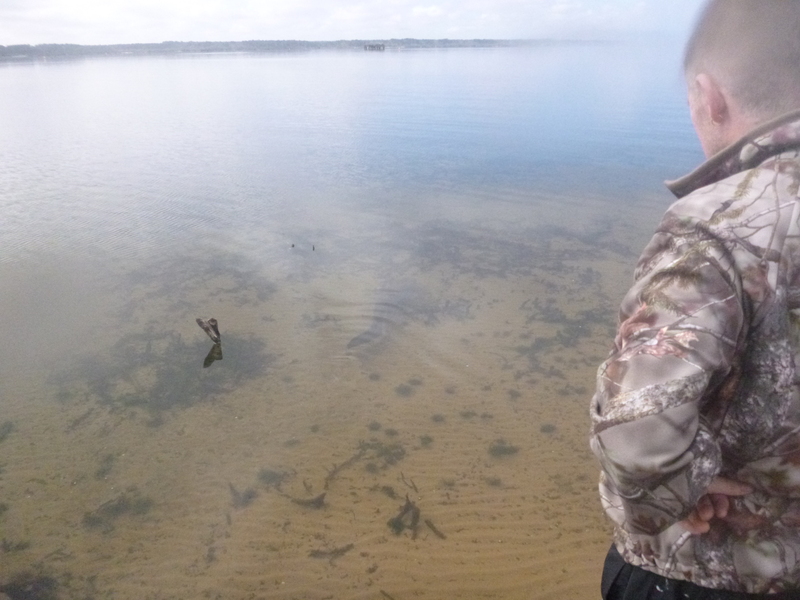 We had the dreaded coin flip for sides, always and area of concern for the eager angler. Personally I like to let the coin decide, that way I’m not left at the end of the holiday kicking myself for picking the wrong side. I can just put it down to bad luck. Well that’s what I tell myself anyway. In this instance the coin flip when my way and i got the side I fancied. Not that it really mattered as i had fished this swim before on my own and had equal amounts of fish from both sides. There was a sand bar out about 300 yards and we placed the bivvy spots to fish either side of it and had agreed to fish left and right of it and fan the other rods back to the drop off 60 yards out in front of us. This way we could try to work out the distance the fish (if any) were passing by at. The lake itself was 10000 acres so it was impossible to predict which way the fish would come. After a few hours messing around with boats,h-blocks and fish finders we were settled in and all we needed for the party to get started was a fish. At 7 am the next morning my second furthest rod out rattled off. I jumped out of bed and hit it, class I thought to myself first morning and I’m into a fish, here we go. I was not long into the fight before i began to think I was into a cat. The strong runs with the tail flapping against the main line is a dead give away, but one can never be sure unless it’s a massive cat. It’s the cats in the 20lbs to 40lbs odd range that can catch you out sometimes. But i was fairly sure this was a cat. I fought it from the bank as long as I could before it got caught in the weed that was on the top of the drop off in front of us. The rod was dropped out at 270 yards and the drop off was about 60 yards out. I’ve found in the past getting into the boat to early with a cat can see you been pulled around the lake like a bubble float for a few hours. Standing with your feet on Terra Firma gives you a lot more control than been pulled around in the boat. The bigger the boat the better, you will tire the fish out quicker but you are left with the problem of netting it and as I’ve found out in the past to my dismay. Carp landing nets are not for cats. The clue is in the name really and until your looking at a cat that’s 1.8 meters long and pointing upwards towards the boat (as i have in the past ) you realise this just is not going to work. The only way is to fight them is from the bank. Not to mention 12 foot carp rods are not great for fighting fish from a boat particularly fish that are bigger than the rod is rated for, theres a good chance of breaking the rod. Anyway I’ll get back to the fish. As it was snagged up the was no other option but to get into the boat and go after it. Davey skipper the boat out as I kept the line tight. We were soon over the fish, who was buried in the weed and although the water was gin clear we could not see it. I pulled the line either way as you do to try and free it from all angles until i conceded to grab the line and do the nervous slow pull hoping for a happy ending. Hoping to feel some movement on the other end and not an uncompromising solid snag. As i put pressure on the line a few bubbles started to emerge where the line was pointed and thankfully a few others away from the line. Then there was movement a few bits of weed snapped and floated up and a cat around 60lbs emerged from the weed. Although not our intended target I still like catching them and to see it swimming around in the clear water is assume. We were able to successfully steer it into the net as it was not a monster and quickly ferried it back to the bank. With a few quick photos and a weighting of the fish, it was back in the water. It was 60lbs,by no means a big cat but i appreciated it all the same. After that we were licking our lips, thinking that this was a great sign of what was to come. That night we were full of anticipation, hoping for an early morning run. The morning came and went and nothing happened. OK two nights in and no carp, well that’s normal on the public’s. Usually it’s the third night in before anything happens. On the morning of the third night I awoke to hear the frantic call of the Edgey fella. This particular high pitched sound is unmistakable, easily distinguishable from any other critter in the surrounding area and can usually be heard shortly after his alarms have indicated a run. It goes like ……DAN…DAN…DAN….I’M IN……I’M IN…. GET THE BOAT….GET THE BOAT !!!!! and that was the end of my lie in! By the time i got up to Davey the fish had found a snag but not on the sand bar in front of us, it was a good way out.We had placed the boat in the middle of the two swims with the net and mat already in the boat so that we could assist each other in the event of a run. It was my turn to skipper the boat. The rod had been placed 300 yards out and not much line had been retrieved so it was a long row for me. But i was happy to do it. On the row out Davey was getting nervous that it had got off. It had not moved in a while and was rock solid. When we got over the fish it seemed to be stuck in weed. We did not even know the weed was there. But again after some nervous pulling and dragging the fish came loose from the weed and the fight began, much to Daveys delight. It was putting up a good fight so again we were undecided on what species Davey was connected to. A good ten minutes later and we seen colour and it was brown. 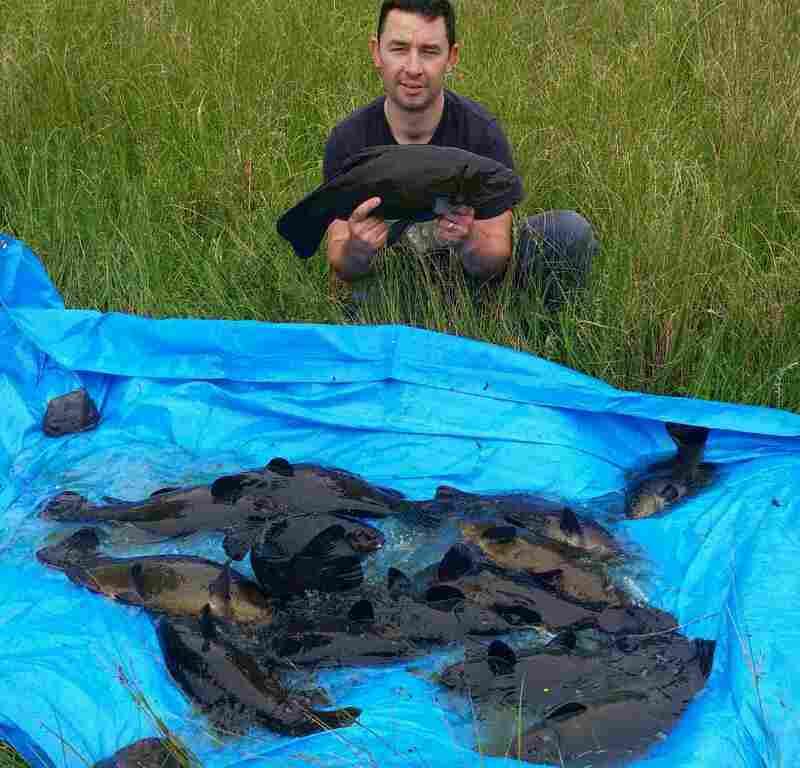 We were dealing with our intended species a “carp” and a mirror carp at that. Although I prefer to fight fish from the bank, there is nothing like watching a carp swimming around the boat in clear water during the day. A short while later Davey had steered it into the waiting net and we headed for the shore. Then the weighting and photo shoot ensued. It weighted in at 31.8lbs and we had it back in the water shortly after. Confidence levels were brimming now and we thought we had cracked it. But sadly that was the end of the action and morning after morning passed fishless. There are many fisherman’s excuses as to why a session doesn’t turn out the way you wanted or expected it to. On this occasion I’m going to blame the Northwest wind that was blowing for a few weeks and the fact that the fish were also going into spawning mode and prespawning is always a difficult time particularly on a 10000 acre water that you are restricted to fishing one or two night zones. So after 6 nights we had to make a decision on wither to move or stay as we had 7 nights left to fish and we both weren’t feeling it. 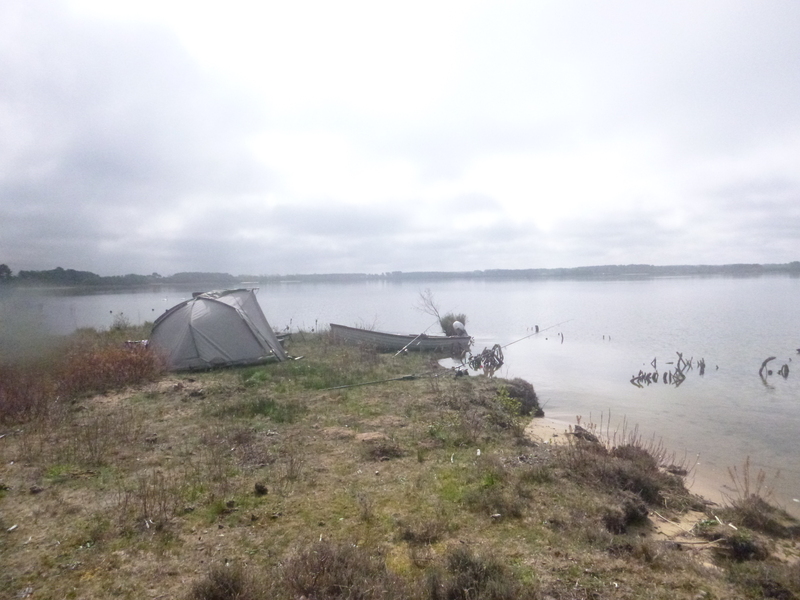 Anyway the decision was made to move and we packed up and left and headed to another lake a bit smaller at a 1000 acres. But with a move you get a refreshed sense of optimism. I’d like to say we made the right decision and hauled, but we didn’t and apart from one dropped run for Davey that was it for the session. We came home with our tails between our legs, no open top bus, no bunting and no cheering crowds awaited us at Rosslare. It was a bad session but I will say we’ve had worse. Carp fishing is hard at the best of times but big public water french carping can be painfully hard and very unrewarding sometimes. But it’s like they say it’s not every throw a coconut. 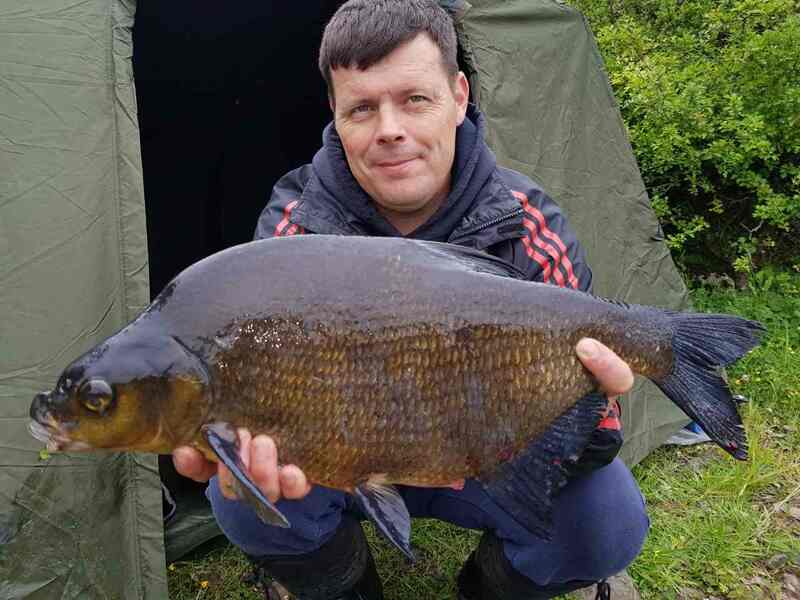 We hadn’t managed to get in a tench session so far this year so Aidan Cox, Joe White and myself decided that we would bait somewhere for a couple of days. The plan was to travel up a few evenings after work and bait up with the bic boat. I called our good friend Dylan Condron to ask how was the fishing lately and tell him our plan. Dylan suggested we get in touch with a friend of his Seamus Smith who provides an excellent prebaiting and pike guiding service. We were only too happy to not have to drive up the few evenings beforehand so this seemed the perfect solution. I got in touch with Seamus and we hatched a plan to meet at 3.30 am on Saturday morning. After meeting Seamus we were soon heading out along twisting narrow roads just as the sky was starting to lighten up. Arriving at our destination we wasted no time in getting the gear down to the swim. Seamus had prebaited the previous couple of nights and we were all gunning to go. 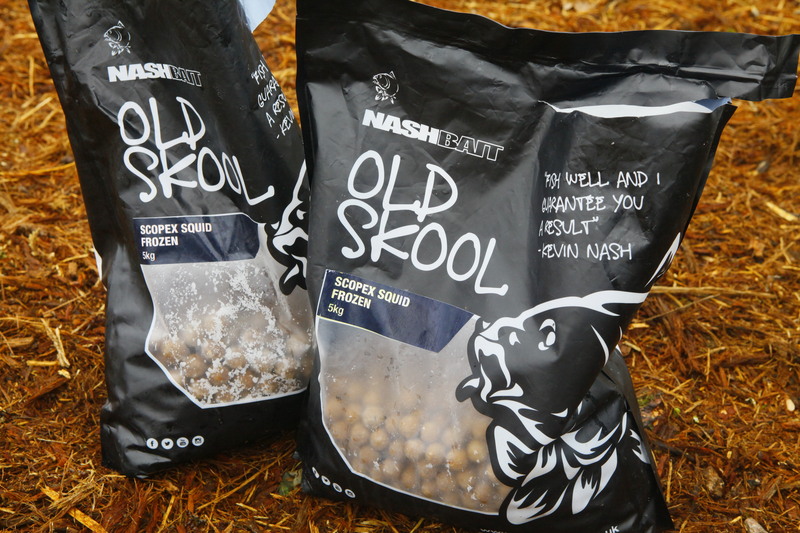 The service Seamus provides is second to none and he also had our bait waiting for us all in top condition. 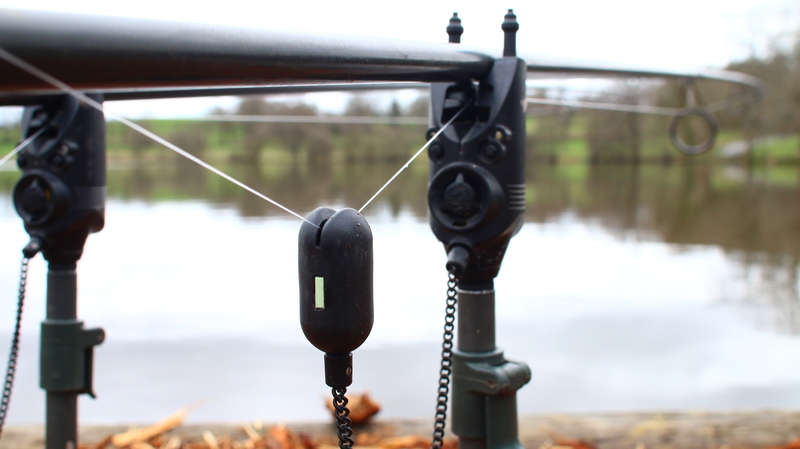 For anglers who travel from around the country or further afield it is a perfect solution. That even Dylan and Damien McCann came up and joined us. 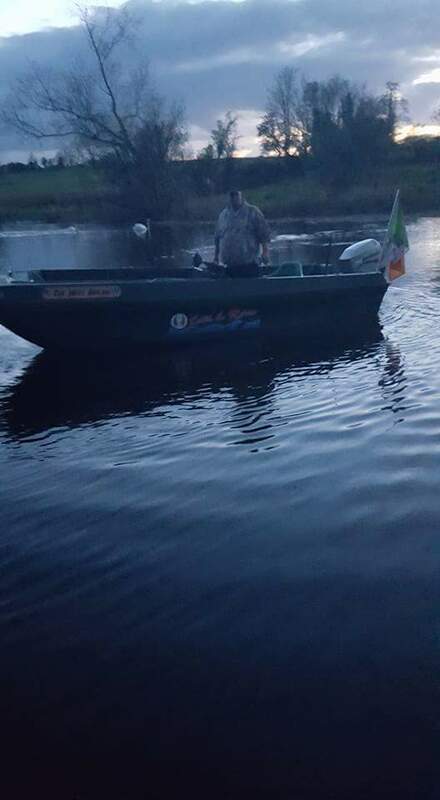 It was some craic that night and a pleasure to see the lads in action as they brought in fish after fish and we picked up a few tips. To contact Seamus please get in touch on his Facebook https://www.facebook.com/Ernecast-1308069715907255/ as we couldn’t recommend it highly enough and thanks to Dylan and Damien. 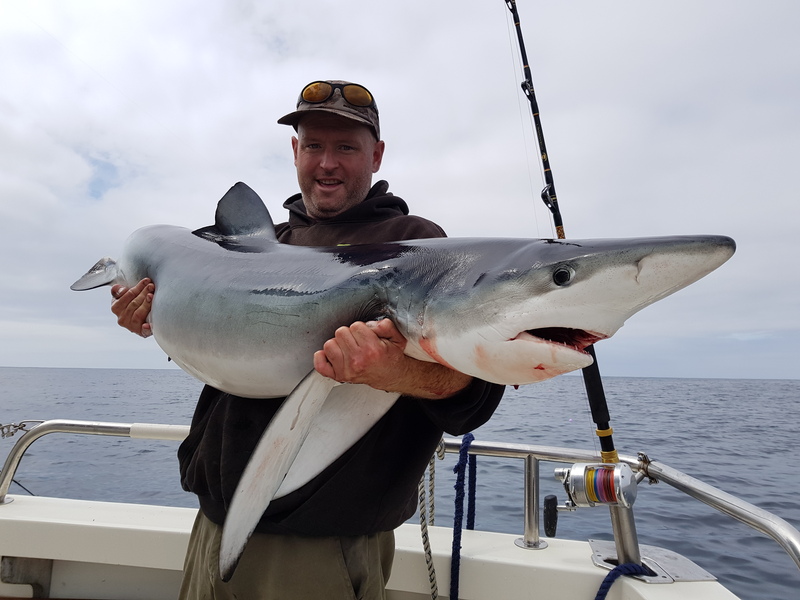 After been chasing blue sharks around the country for the last few years, myself and a few friends decided we wanted to go after a Porgie. 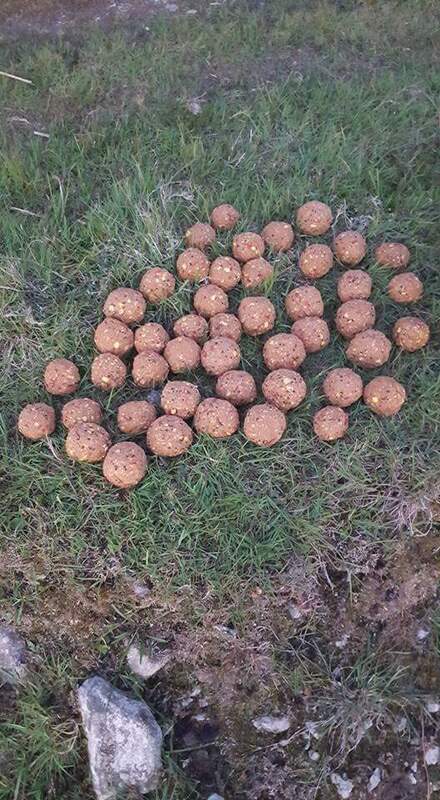 We anglers are never happy with what we are catching and just want bigger and better all the time and this is the case in this instance. We had seen the pictures of porgies knocking about on Facebook and these sharks looked formidable and just down right dangerous. After doing some research and after a good few chats with Paddy on the subject it was clear that it was not going to be easy. 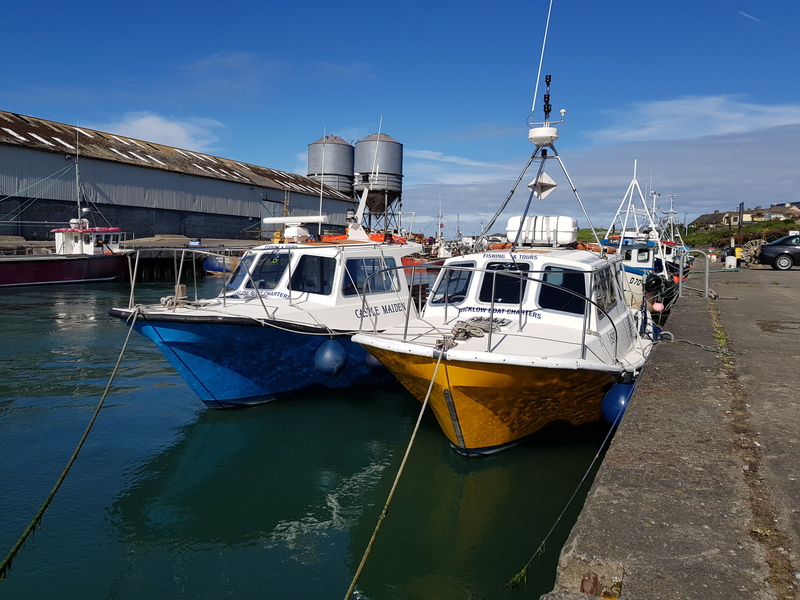 They seem to be far more unpredictable that the blues and some blanking was going to be on the cards as working out their movements around the coast of Ireland was not going to happen on the first trip. 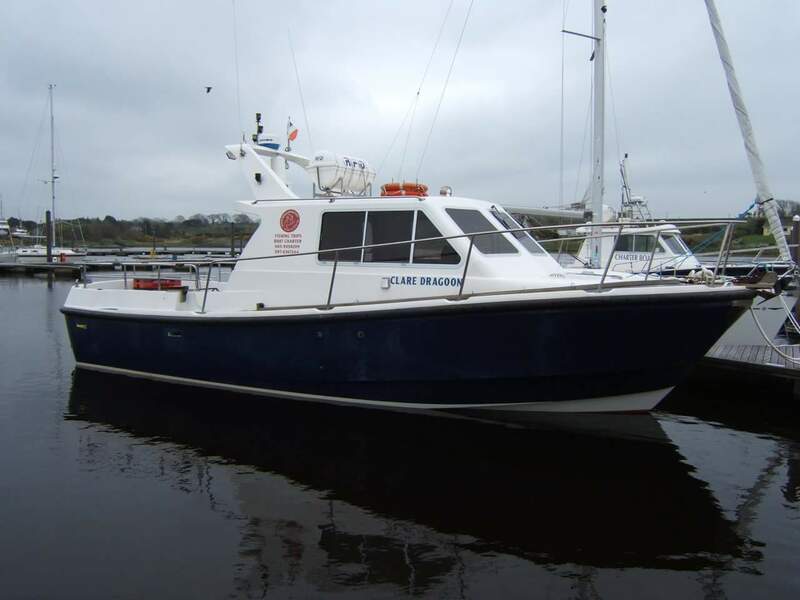 Our first attempt was on Kit Dunne’s boat of Wicklow charters out of Kilmore quay at the time.We travelled out 30 miles into the Irish sea and gave it a go. 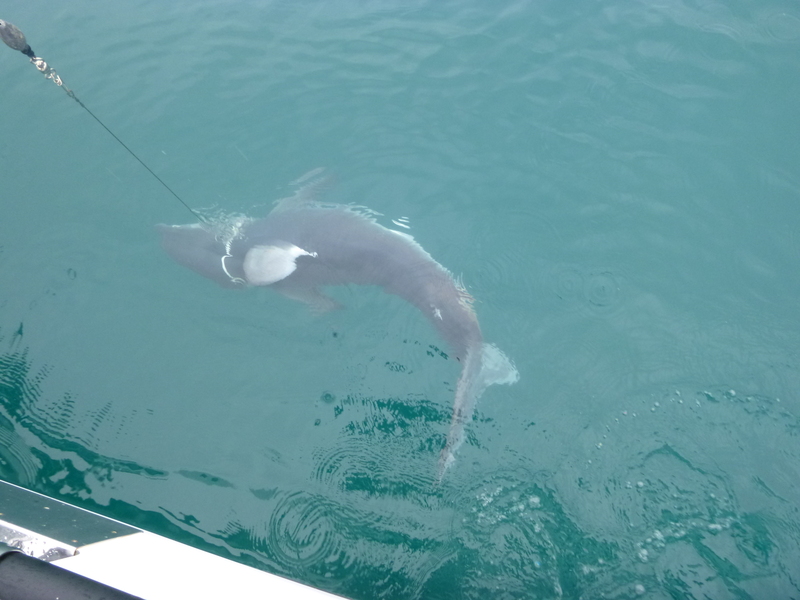 We did not get any that day but had some nice blues which were the first sharks on Kit’s boat so there was a great atmosphere on the boat and I was glad to be part of that day. 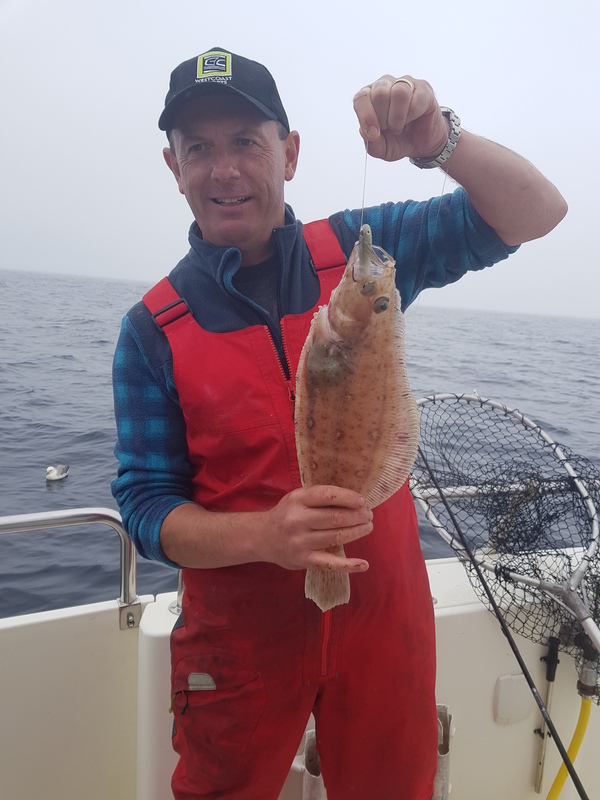 The second attempt was again on Kit’s boat this time out of Wicklow again we went miles out but this time a Spurdog and a Tope was all we could tempt into the slick and onto our baits. Then we tried Galway bay on John Fleming’s boat. 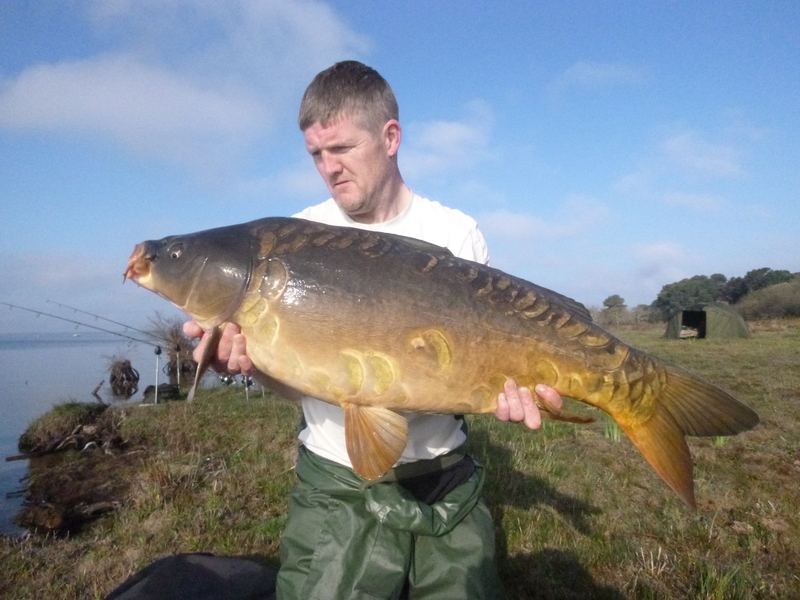 The first time in fairness was mainly for Blues and we had some nice ones, well Rory did the rest of us blanked. The second time we tried a different spot closer to the shore, but sadly nothing came of it. Earlier this year we tried a mark with Kinsale Charters that had produced Porgies for Mike and Pedro last year on their first attempt at them. So we thought it would be a good place to start again they eluded us. We will be back to give that spot another go. It was becoming very clear that this project was not going to be easy. We needed some schooling on these creatures. 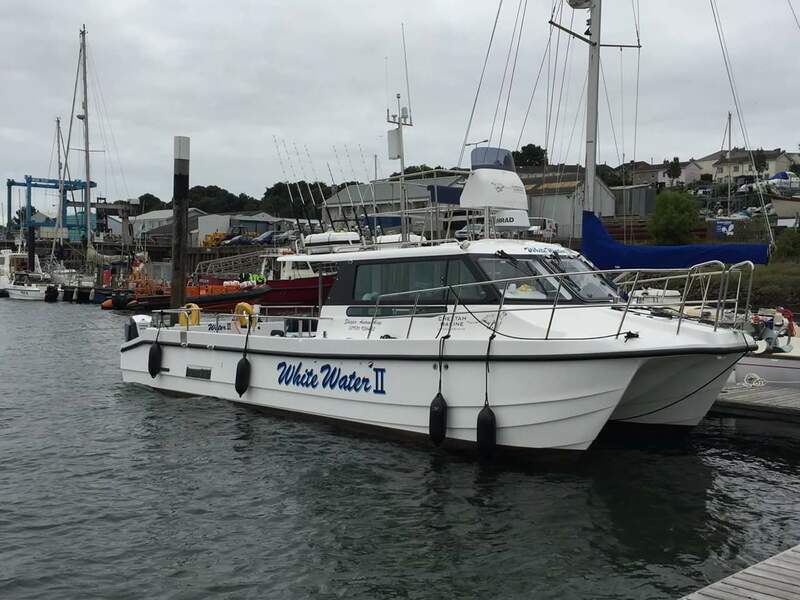 Further chats with Paddy on the subject lead me to contact Andrew Alsop of White Waters in Milford haven. Not an easy man to get a booking with due to his reputation and long history of catching all manner of sharks that are available in ours waters. Thankfully he had two mid week days open in late may of this year. So we booked our ferry and started counting the sleeps til our departure from Rosslare. Finally the day arrived and we headed off to Rosslare to get the ferry to Fishguard. We travelled with Stenaline to Fishguard as the times of the Irish Ferries to Pembroke sailings did not suit us. Pembroke was a shorter drive to Milford but the drive from Fishguard was only 30 mins or so, so it was not an issue. We had booked into a B&B in Milford run by Gareth and Trish Hopkins as advised by Andrew. I always find it better to book with someone the skipper advises as they will normally be understanding if you have to cancel due to bad weather. 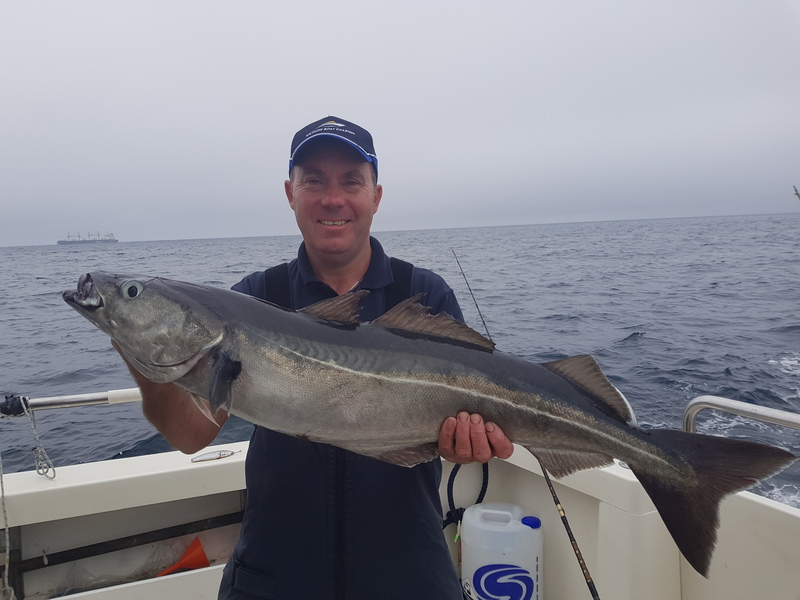 Gareth been an avid an experienced angler himself is well versed in what the sea can do and won’t hold you accountable if you have to cancel. It’s also great to be able to sit down and have a good auld fishing chat with someone that understands your madness. Needless to say the apartment we had was spot on and only a few minutes from the dock and the Hopkins were great hosts. After a comfortable nights sleep and a quick breakfast we did the short drive to the dock to meet Andrew and load up our gear. Andrew supplies all the gear you need but we did bring our own rods and reels. Shortly after we were heading down through the haven, (which is basically a 10 mile long fjord ) at a rate of knots and when I say a rate of knots I mean a rate of knots. The White Water two is a impressive vessel to be reckoned with. 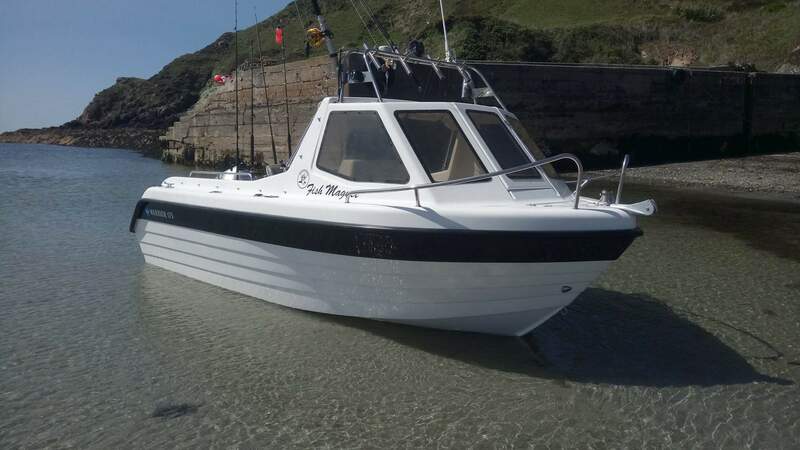 The boat is less than a year old, its a catamaran powered by two 300 hp 2 stroke outboards, yes you read that right 2 strokes. These new 2 ST engines are more powerful than 4 ST, cleaner and more efficient. I thought 2 ST were taking off the market, how wrong was I. Blowing down the haven with Iron maiden blasting from the wheel house is something I won’t forget anytime soon. In total we travelled 50 miles out and it only took 2 hours. As we got close to the mark that Andrew wanted to fish we slowed down and started to make the chum. Andrew had all the fish we needed for both the hook baits and the chum. Not long after the chum bucket was in the water and our slick had started, so we set about getting the rods ready. Although we had our own traces with us we decided to use the traces that Andrew supplied as A. He has far more experience at this that we had and B . He doesn’t charge for them. Plus I just wanted to see his ones so we could see where we had gone wrong with oursit. It’s all a learning curve at the end of the day and we have a lot to learn about fishing for Porgies. Needless to say over the coarse of the next two days many question’s were asked and answered. We had decided to fish our own rods til one of us caught a fish then that person would sit down and let the other fish on all the rods til he caught one then we would go back to just fishing our own rods. 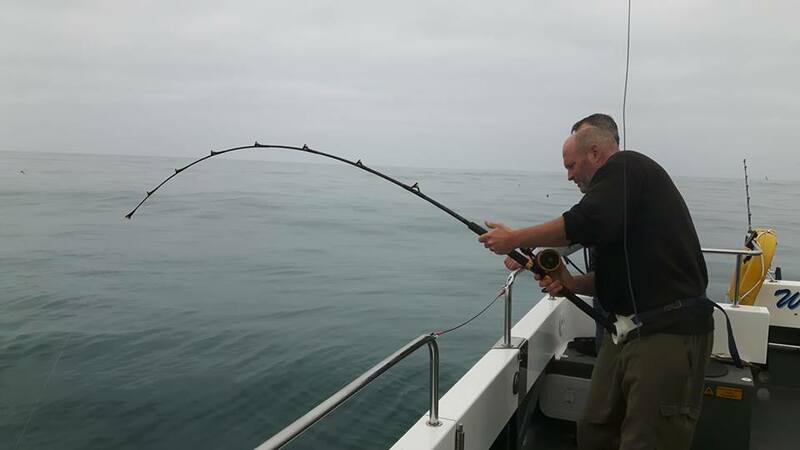 My second rod was only in the water and the balloon was no more than 10ft from the boat when i noticed the balloon slightly tip then again, then it move against the tide only a few inch’s but enough to let me know that it was a fish plucking at the bait. I had heard that Porgies are fussy takers , not like blues. I was unsure what way or time to strike the fish so i quickly conferred with Andrew, who stepped me through it. basically I didn’t know to hit it or just push the lever drag forward. The fish started taking line so I pushed the lever forward as instructed and then I felt contact and the fight began. Now this is what I had been waiting for, I had been told that the fight is completely different than blues so I was not sure what to expect. In no time the fish was heading around the boat maybe in an attempt to get me under the props so Mark and Andrew started lifting rods so I could pass underneath, then the fish turned around and when back the way she came. Then a massive nose dive and she headed straight for the bottom. Although I was quite sure it was a Porgie we couldn’t rule out a blue at this stage and there was some debate/uncertainty about what species of Shark it was. 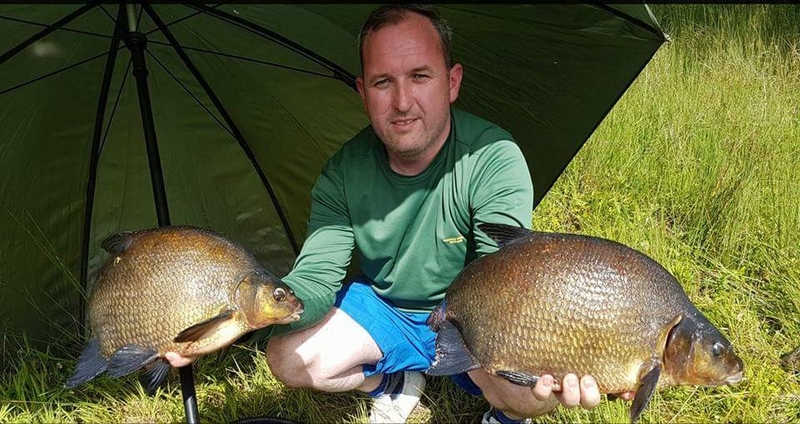 I knew it wasn’t massive but I did not care as long as it was my first Porgie, size was not important in this instance. A few more long deep runs and I got some line back on the reel and we started to see some colour, then she came into sight and it was a Porgie, not a monster but a Porgie at last. 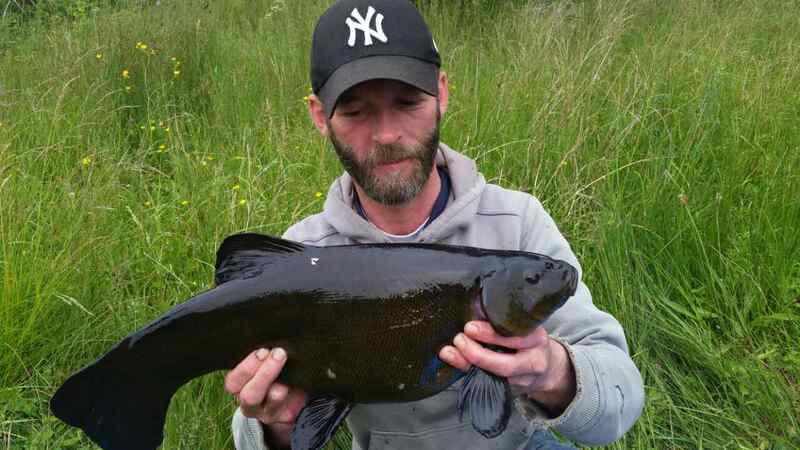 This was the first time for me to see one let alone catch one so I was well happy. She made one more run and she was beat. A few nervous moments after the leader was grabbed, the fish was lassoed quite expertly by Andrew and then pulled on board by himself and Mark. Although I was very confident that Andrew could boat the fish I always feel a few moments of helplessness when I’m standing there holding the rod just in case the fish bolts again. Thankfully my momentary feeling of nervousness and helplessness abated quickly when my prize was safely on board. All that was left to do was get some photos and get her back in the water, so after some quick schooling on how to hold them we got a few shots and released her. Mission accomplished !!! I forgot to measure her in the whole drama of the situation. But I know the girth was around 35 inch’s. How I know this is, during the fight Andrew had noticed that the fish had a box strap wrapped around its neck. 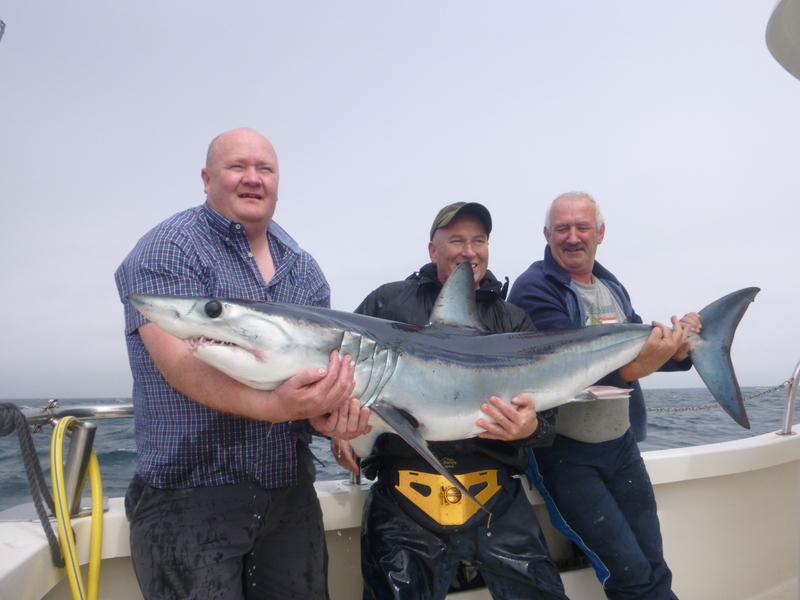 He said that it was about the fifth Porgie that he had seen like this, but never seen a blue shark with one. I can only imagine that they are probably more inquisitive and curious than blues and end up swimming into them. Which would suggest they are far more intelligent than blues and would part explain why they are far harder to get a hook up from. Anyway we removed the strap, which had become embedded in the fish’s skin and flesh. 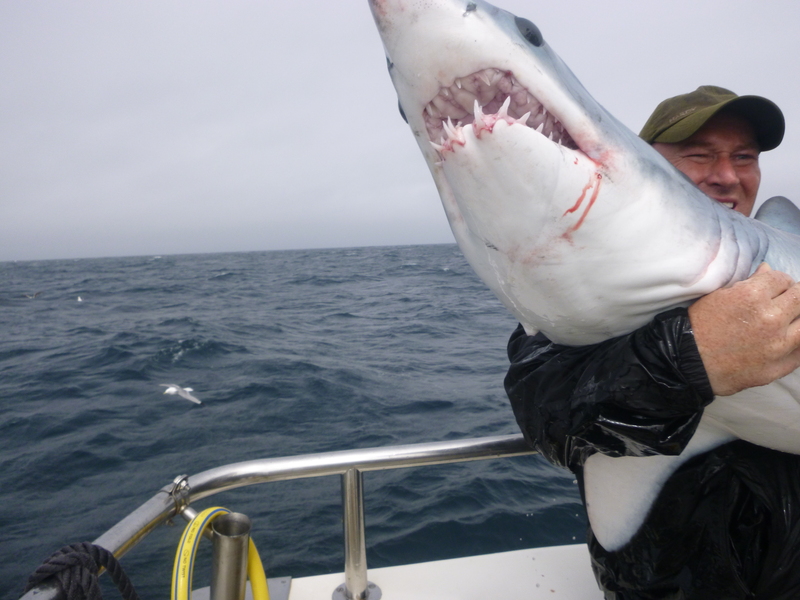 Later after realising that I had not measured her I had the brain wave to measure the strap and it was 33 inch and maybe allowing 2 inch for the depth it was cut into the flesh of the Shark. Either way Andrew estimated that it was around 80lbs. 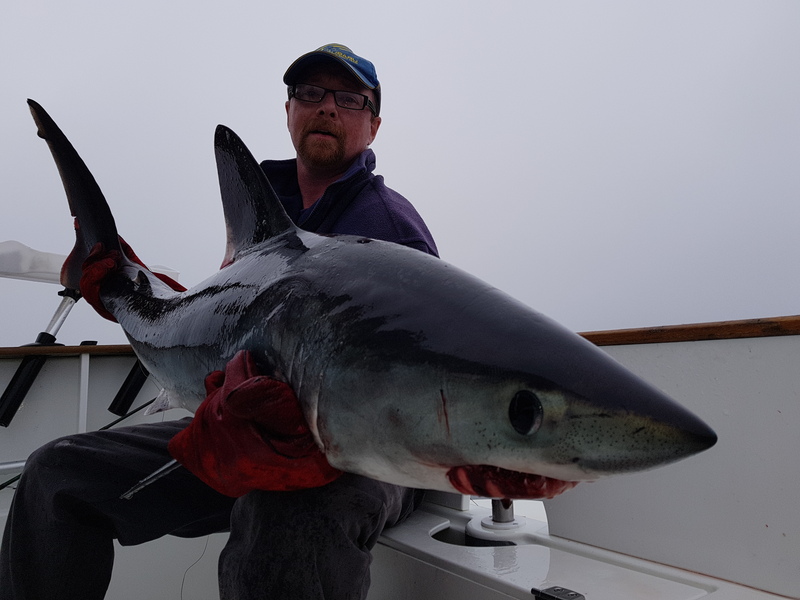 Not a monster by Porgie standards but I’m happy to start with that and the fact that is was the first shark on the White Water 2 of 2017 and the first shark of Andrews twentieth year in Chartering for sharks I was honoured. Unfortunately that was all the action we had for the rest of that day and the next day apart from one of the baits having bite marks on it the first day. So the time was spent talking about all things Sharky and trying to get that perfect photo of a dolphin jumping which always eludes me, as was the case this time as well. We did have a Minke Whale circle the boat for a while which was interesting. All in all I think a lot of patience is required for Porgie fishing, But the rewards are there and I can’t wait til my next encounter with one. 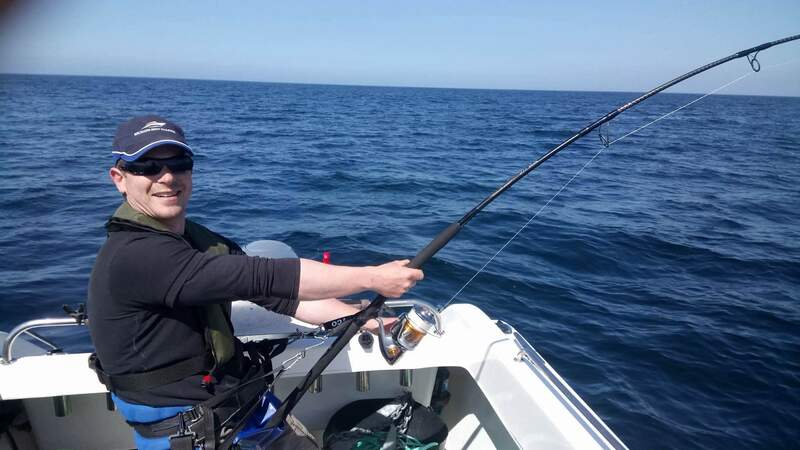 Well as many of you know anglers fishing with us here at Carrigaholt Sea Angling have made some headlines over the last month! I suppose it started with enquires almost a year ago now and then confirmed bookings at the end of last year. 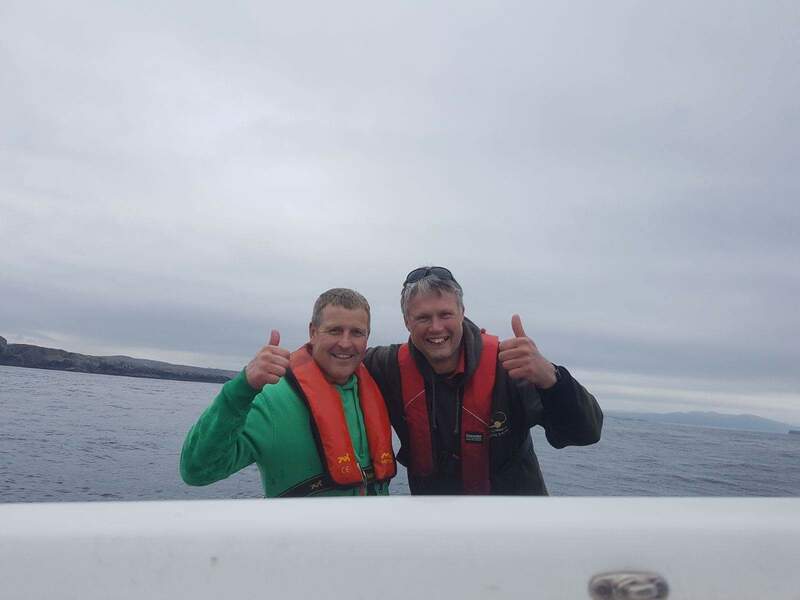 First over where the 2 Ben’s from Somerset, they took a chance and booked a 3 day fishing trip with us for the first week in May. The plan was to be here for 3 days but to fish the 2 best of them. As they arrived the forecast was quite promising but with the weather disapproving. So we got out the first day and it was perfect. No wind and almost flat seas. We got our first take during the afternoon and after a 25min fight Ben Carter had an 18foot Shark to the side of the boat. A real bonus was that Ben had brought a drone with him and we got some great aerial footage of the Clare Dragoon with the shark beside the boat. The next day was slightly windier but still perfect and although we did have at least one good bite we did not manage to hook up. So that night the Ben’s asked if they could do the third day. Although the forecast was not perfect I was happy to give it a go and as is often the case, once we went for it the conditions were not bad. 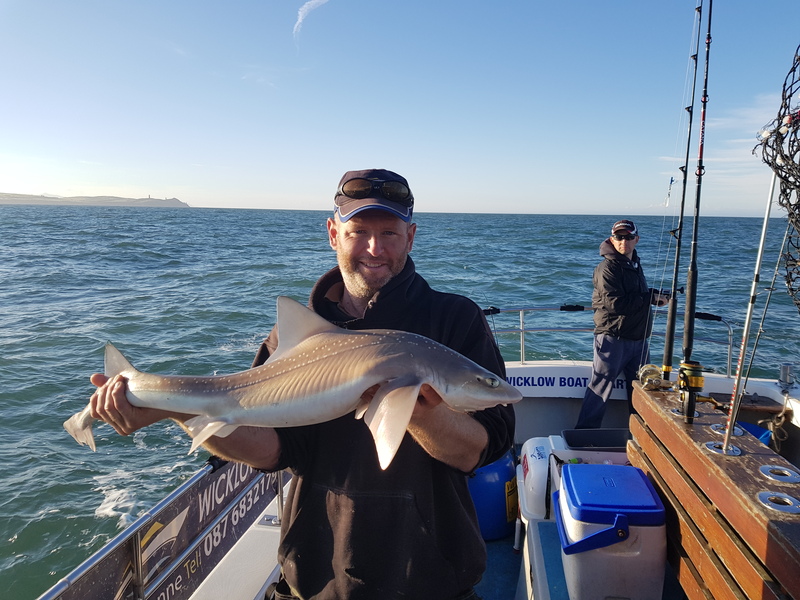 The lads were fishing a rod each but as Ben Carter had already got his Shark he was happy that Ben Bond would have the first hook up regardless which rod it was on. As it happened we put down a quite day until it was almost time to go when we got a good hook up. Ben Bond got rigged up with a harness and then got stuck into what turned into an hour and a half fight. His fish seemed to be willing to come to mid water but no further! 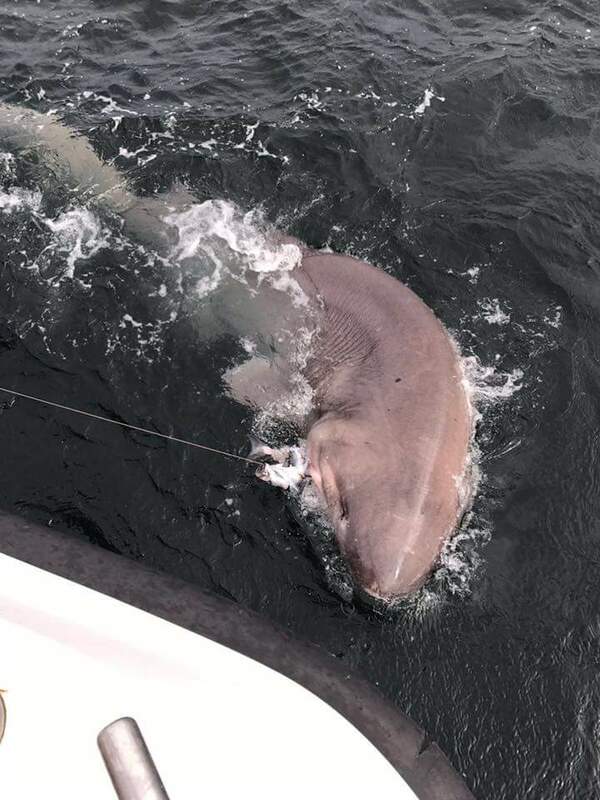 When at last he got it to the surface it was a massive fish and as it lay along side the boat we called it at 25ft and about 1500lbs. Unfortunately mainly because it was now quite windy we could not fly the drone but we got lots of good pictures and film from the boat. 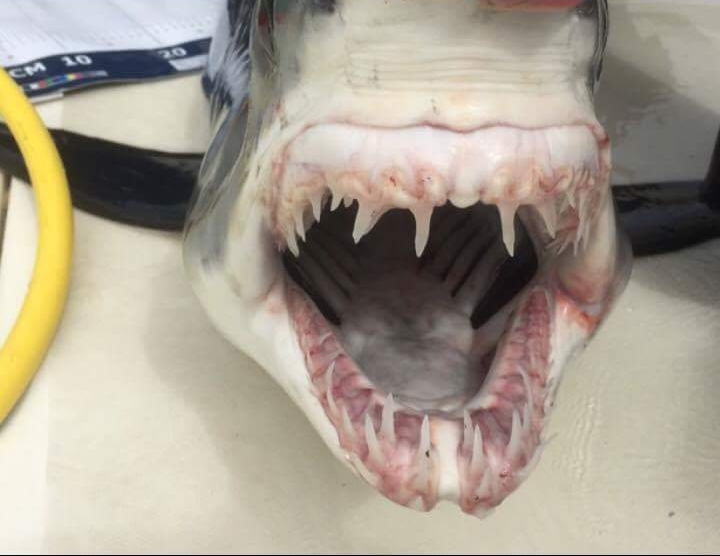 Just as a side note to those two Sharks. I was using marks alongside the boat to measure them. As the longest up to that was just around the 18ft I knew my mark there but the bigger one was longer that any before. I took a tape to the boat the next day after the lads had headed for home and measured the mark for the bigger fish at 22ft 11 inches. Weights are always only an estimate if you do not take them in to weigh so I can only go off the one I did weigh which was 12ft 9inches and 1056lbs. 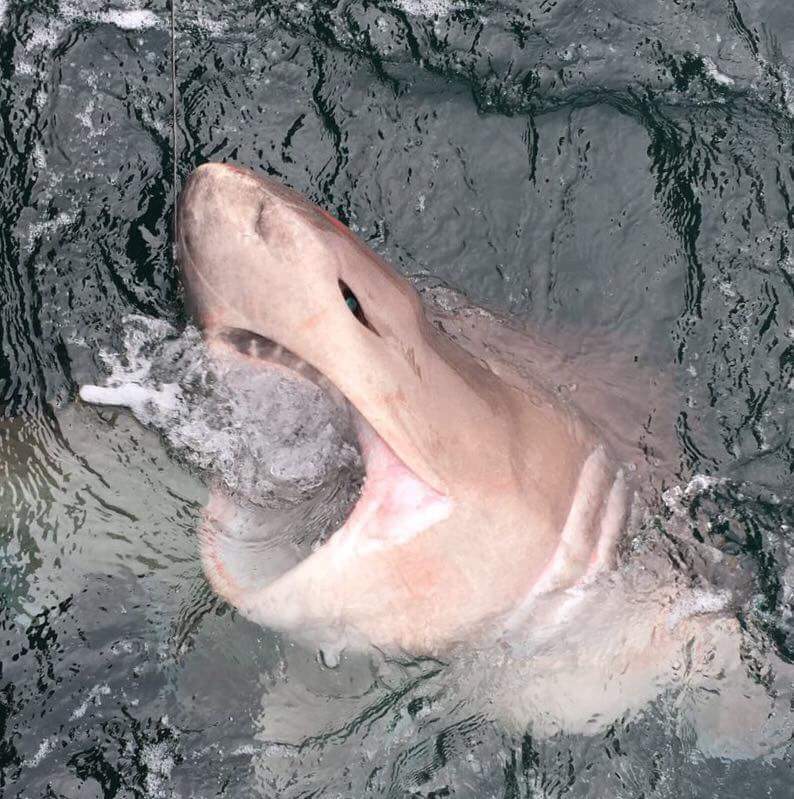 I think it was safe to say Ben Carters shark was over a 1000lbs and as Ben Bonds fish was just massive I knew I was being very conservative at 1500lbs. We will never be sure but it would not surprise me if it was nearer 2000lbs!! Next up was the week just passed and Andy Griffith’s trip. 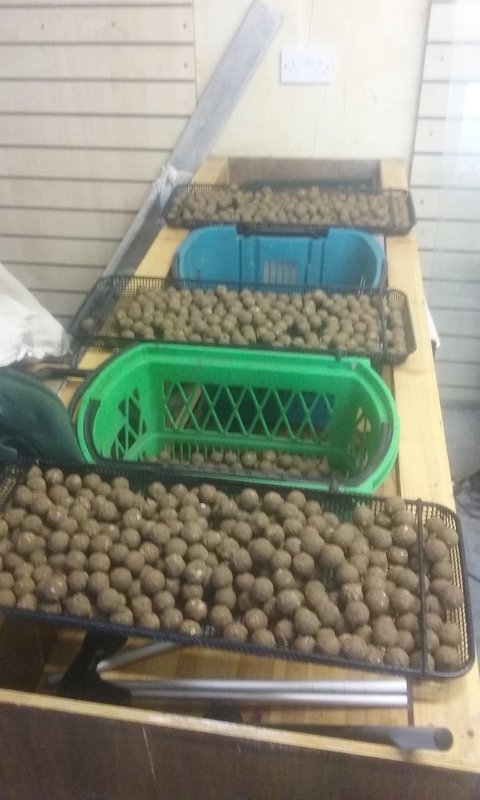 Although he had tentivitly booked 3 days fishing over these dates at the end of last year I was happy to move them about a bit during the week depending on the weather. So he had not booked flights and was playing a waiting game. On Wednesday the 17th we had a chat on the phone and although the forecast was very changeable we felt we would get some window so he got the flights. We planed to then make the most of the weather even if the “3” days got rolled up into one long session. As it happed the Tuesday was all right and we got a standard day with one Sixgill during the afternoon which was about 9 ft and 600lbs. Andy was chuffed as he had got his target but was also keen to go again as he hoped to break the 1000lb mark. We decided to throw it all at the Wednesday as the forecast was not great for the day after. So we headed out with the plan to fish until dark. As it happened Andy got his first hook up of the day at just after 6pm. 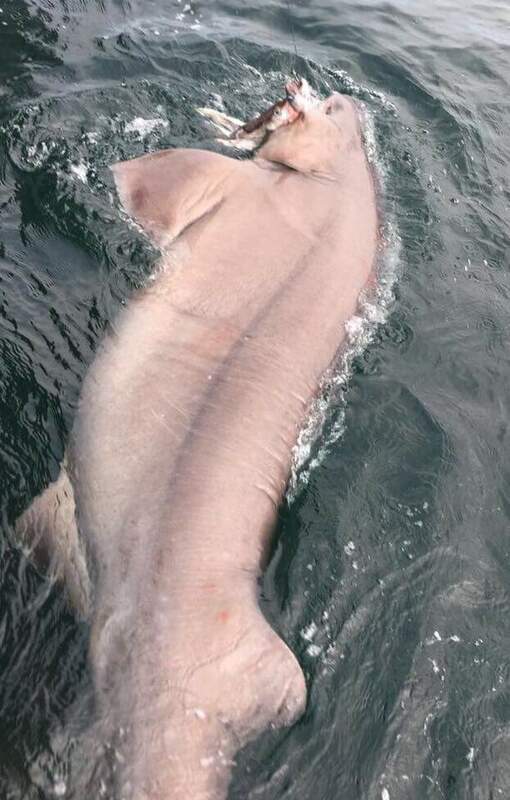 A 20min fight had a 14ft Sixgill to the boat. The Grander was bagged! 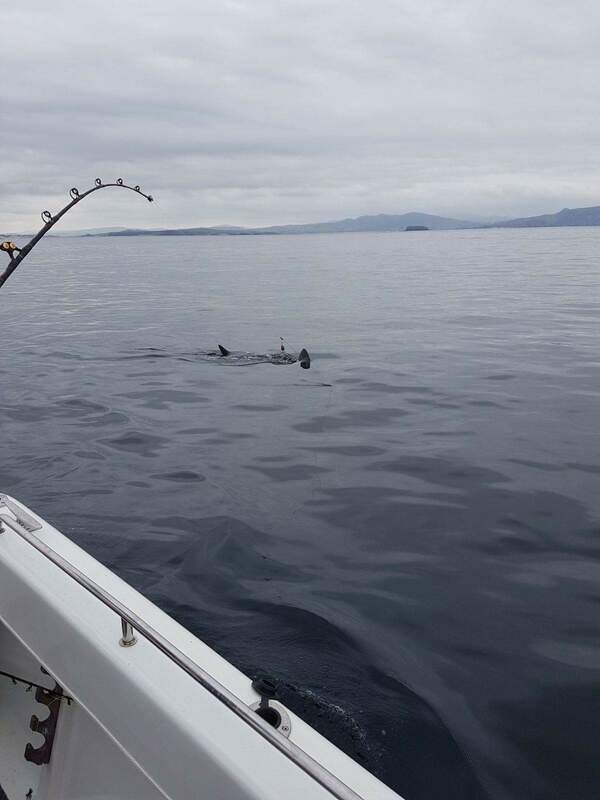 We put out another bait and took to the wheelhouse for some dinner, it was a case of job done…will we just put in another while?! I must admit that I did not expect any more action. Then at 7.45 we got a good hard run and another hook up. 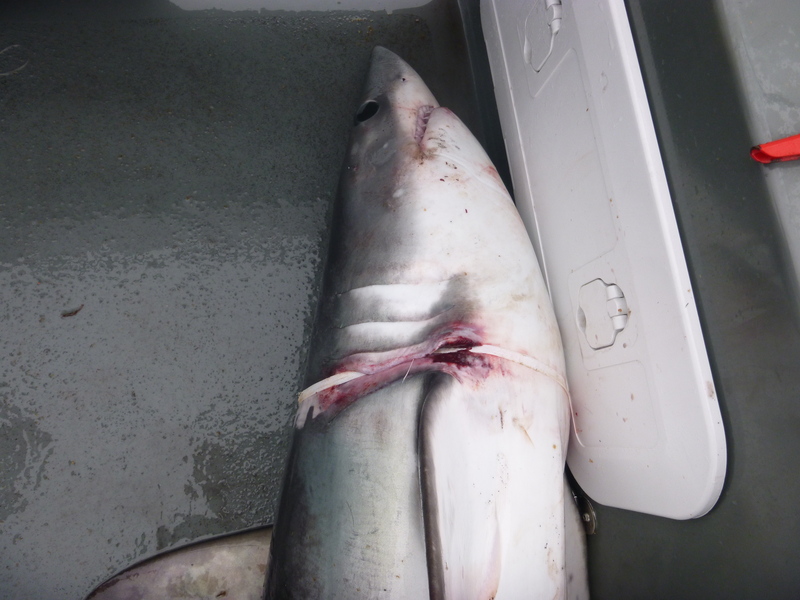 This shark took a lot for fighting but after a hard hour Andy had a very feisty 18footer to the boat. Again taking in the benchmark of the landed Shark I estimated Andy’s 2 Sixgill at 1150 and 1400lbs. 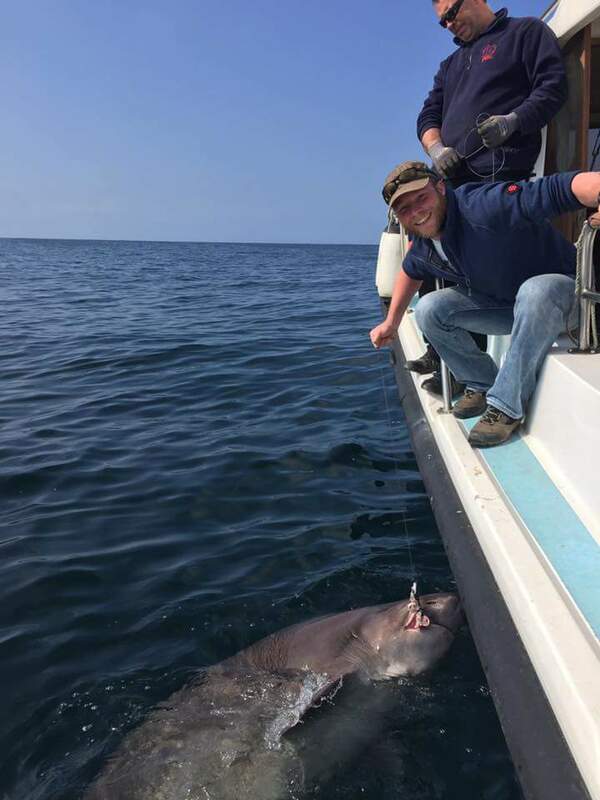 One thing for sure they where both over 1000lbs and 2 1000lb Shark in one days fishing is a high bar!